In an embodiment, a multi-layer article having an interior, the article comprises a second layer comprising a bisphenol A polycarbonate; and an inner layer comprising a terephthalic copolyester; polyethylene furanoate; or a combination comprising at least one of the foregoing; wherein the inner layer forms a barrier between the second layer and the interior. The article has at least one of: a decrease in transparency of less than or equal to 5% after sterilization in an autoclave for 30 minutes at 120 DEG C, and a decrease in transparency of less than or equal to 5% after 50 cycles of hot filling with water for 30 minutes at 90 DEG C.
 本申请要求于2015年4月28日提交的欧洲申请序列号15382213的权益，其全部内容通过引用并入本文。  This application claims the benefit of April 28, 2015 filed European application serial number 15382213, the entire contents of which are incorporated herein by reference. 本公开涉及多层材料以及由其制造的制品。  The present disclosure relates to multi-layer materials and articles made therefrom. 目前由许多不同类型的材料，包括塑料和玻璃制造容器，如水瓶和食物容器。  Currently many different types of materials, including plastic and glass container manufacturing, such as water bottles and food containers. 例如，食品包装和保健容器通常由玻璃形成以提供透明性、适当的氧气和/或阻隔性能，和/或以满足消毒或热填充过程。 For example, food packaging containers, and generally to provide health transparency, proper oxygen and / or barrier properties, and / or to meet the hot filling or sterilization process is formed of glass. 然而，在生产或运输过程中，玻璃容器可能破碎或破裂，这意味着可能中断或停止生产线和/或可能抛弃产品。 However, in the production or transport, glass containers may break or rupture, which means that may interrupt or stop the line and / or may discard the product. 目前，用于包装的玻璃可以承受高热消毒条件、热填充，并保持透明和/或具有长期保质期的能力。 At present, glass is used for packaging can withstand heat sterilization conditions, hot filling, and the transparency and / or having long-term shelf life capability. 然而，在玻璃容器生产中涉及的高能耗、玻璃的重的重量、以及其在生产、运输、和消费者使用过程中易碎性是麻烦的。 However, high energy consumption involved in the production of glass containers, the weight of the weight of the glass, as well as its production, transportation, and consumer use of the process is cumbersome friability. 相比于聚碳酸酯，聚合物如PET (聚对苯二甲酸乙二醇酯）、PBT (聚对苯二甲酸丁二醇酯）、PEF (聚呋喃二甲酸乙二醇酯）、和PEN (聚萘二甲酸乙二醇酯)可以具有在所选条件下(例如，相对于水、氧气(O2)和/或二氧化碳(CO2)渗透)的对于塑料瓶的更好阻隔性能，在这样的材料的玻璃温度以上的热处理以后，这样的材料可能变得雾化。  Compared to a polycarbonate, a polymer such as PET (polyethylene terephthalate), PBT (poly butylene terephthalate), the PEF (polyfuran polyethylene terephthalate) , and PEN (polyethylene naphthalate polyethylene terephthalate) may have under the selected conditions (e.g., with respect to water, oxygen (O2) and / or carbon dioxide (CO2) permeability) plastic bottle for better barrier properties, after the heat treatment at a glass temperature of such materials, such materials may become atomized. 这种雾化的形成可能是因为这些类型材料的固有的聚合物性质(例如，玻璃化转变温度(Tg)和半结晶时间）。 Such spray forming may be due to inherent polymer properties of these types of materials (e.g., glass transition temperature (Tg) and crystallization half time). 因此，本领域中需要包括改善的功能阻挡层以防止气体渗透和某些物质（例如， O2XO2和其它组分)在制品（例如，包装)和在制品中的内含物之间的迀移的聚碳酸酯制品(例如，瓶和食物容器），同时继续提供聚碳酸酯材料的有益特征如许多应用所期望的透明性、强度、和热稳定性中的一种或多种。  Accordingly, a need in the art including improved functional barrier layer to prevent permeation of gas and certain substances (e.g., O2XO2 and other components) in the article (e.g., packaging) and inclusions in the article between the Gan shift polycarbonate articles (e.g., bottles and food containers), while continuing to provide a polycarbonate material such as one or more beneficial characteristics desired for many applications transparency, strength, and thermal stability of the. 本文公开了一种制品，其制造和使用其的方法。  Disclosed herein is an article of manufacture and method of use thereof. 在一种实施方式中，多层制品具有内部，制品包含第二层，其包含双酚A聚碳酸酯； 和内层，其包含对苯二甲酸共聚酯、聚呋喃二甲酸乙二醇酯、或包含前述中的至少一种的组合;其中内层形成在第二层和内部之间的阻挡层。  In one embodiment, the multilayer article having an interior, the article comprises a second layer comprising a bisphenol A polycarbonate; and an inner layer comprising a copolyester of terephthalic acid, polyethylene furan dicarboxylate B glycol esters, or combinations comprising at least one of the foregoing; wherein the inner layer is formed between the second barrier layer and the inner layer. 制品具有以下中的至少一项：在120°C下在高压釜中消毒30分钟以后的小于或等于5%的透明度的降低，以及在90°C下在用水热填充30分钟的50个循环以后的小于或等于5%的透明度的降低。 After sterilization reduce the transparency of less than or equal to 5% after 30 minutes in an autoclave at 120 ° C, and at 90 ° C for 50 cycles of filling in hot water for 30 minutes: the article has at least one of is less than or equal to 5% reduction in transparency. 在一种实施方式中，制造多层制品的方法包括利用热成型、吹塑、挤出吹塑、挤出拉伸模塑、注射模塑、注射吹塑、注射拉伸吹塑、包覆模塑、注射包覆模塑、或包含前述中的至少一种的组合来形成具有第二层和内层的制品。 Method  In one embodiment, the multilayer article of manufacture including the use of thermoforming, blow molding, extrusion blow molding, extrusion stretch molding, injection molding, injection blow molding, injection stretch blow molding, coating molding, injection molding covering, comprising at least one or a combination of the foregoing to form a second layer and the inner layer having articles. 以下在详细描述和附图中阐述制品和方法的进一步的特征。  The following further features set forth in the articles and methods detailed description and drawings. 现在参照附图，其是示例性实施方式，以及其中相同的元件编号相同。  Referring now to the drawings, which are exemplary embodiments, and wherein like elements are numbered alike. 图6是在实施例2的高压釜程序1以后的容器2-3的照片。  FIG. 6 is a photograph of containers 2-3 in the autoclave after Example 2 the procedure of Example 1. 对于在食品和保健行业中的包装应用，通过容器的气体渗透和在容器中某些组分的存在的可接受的限度变得越来越严格。  For packaging applications in the food and health industry, and penetration through the gas container in a container acceptable limits the presence of certain components become more stringent. 已经做出了努力来提供阻隔涂层，例如对于PET制品，发现当经受90°C大于或等于30分钟时，这样的双层系统变得雾化，例如，如在典型的消毒过程中会发生。 Efforts have been made to provide a barrier coating, for example, PET articles, found that when subjected to 90 ° C is greater than or equal to 30 minutes, such a double system becomes atomized, e.g., as in a typical sterilization process will occur . 令人惊讶地发现，包含聚酯内层和聚碳酸酯第二层并具有大于90%的透射和小于2.5%的雾度值的多层材料在消毒和/或热循环以后能够保持透射和雾度值。 It was surprisingly found that a polyester inner layer and a second layer comprising a polycarbonate and having a multilayer material that transmits more than 90% and a haze value of less than 2.5% transmission and haze can be maintained after sterilization and / or heat cycle value. 本发明的多层结构可以在消毒期间保持其透明度的事实是特别令人惊讶的，因为聚酯层的玻璃化转变温度(Tg)—般低于消毒温度。 The multilayer structure of the present invention is the fact that it can maintain transparency during sterilization is particularly surprising, because the glass transition temperature (Tg) of the polyester layer - generally lower than the sterilization temperature. 不受理论束缚，据信，在内层和第二层之间产生了一定的协同作用，其允许多层材料能够保持其透明度和其尺寸稳定性。 Being bound by theory, it is believed that, between the inner layer and the second layer had a synergistic effect, which allows the multilayer material capable of maintaining its transparency and dimensional stability. 具体地，多层材料包含至少部分地由聚碳酸酯材料形成的第二层(本文中还称为聚碳酸酯层），和少部分地由聚酯形成的内层(本文中还称为第一层或聚酯层）。  Specifically, the multilayer material comprises a second layer at least partially formed of a polycarbonate material (also referred to herein polycarbonate layer), and an inner layer (herein, at least partially also formed of polyester referred to as a first layer or a polyester layer). 可以使多层材料形成到容器内（例如，瓶和具体地用于水瓶和婴儿奶瓶），例如，通过热成型、吹塑、共挤出、注射模塑、包覆模塑、或包含前述中的至少一种的任何组合;例如，挤出吹塑、挤出拉伸模塑、注射吹塑、注射拉伸吹塑、注射包覆模塑。 The multilayer material can be formed into containers (e.g., bottles and in particular for baby bottles and water bottles), for example, by thermoforming, blow molding, co-extrusion, injection molding, coating molding, or comprising the foregoing any combination of at least one; for example, extrusion blow molding, extrusion stretch molding, injection blow molding, injection stretch blow molding, injection overmolding. 配置有多层材料形成的容器使得聚碳酸酯层不是在内侧上。  The multilayer material are disposed such that the container is formed not on the inner side of the polycarbonate layer. 换句话说，聚碳酸酯层不是在可以直接物理接触容器的内含物的位置。 In other words, the position of the polycarbonate layer inclusions not in direct physical contact with the container. 因此，物理接触容器的内含物的内层不含聚碳酸酯。 Thus, the inner polycarbonate free of physical contact with the container contents. 例如，聚碳酸酯层可以是在容器的外部或外侧上或在容器的层之间（例如，在容器的外层和内层之间）。 For example, the polycarbonate layer may be on the exterior or outside of the container or the container between the layers (e.g., between outer and inner layers of the container). 以这种方式，使内层接触在容器内的内含物(例如，液体，（例如， 饮料(如苏打水、水、果汁、醇等）、食物、或保健产品（例如，化妆品、药品等)）。 In this manner, the inner layer in contact with the container contents (e.g., liquid, (e.g., a beverage (such as soda, water, juice, alcohol, etc. ), food, or health care products (e.g., cosmetics, pharmaceuticals, etc. )). 内层可以包含聚酯（如聚萘二甲酸乙二醇酯（PEN)或聚呋喃二甲酸乙二醇酯(PEF))、对苯二甲酸共聚酯（如聚（聚对苯二甲酸2，2，4，4-四甲基-1，3-环亚丁基酯)-共-聚(对苯二甲酸环己烷二亚甲基酯）（PTCC);聚（对苯二甲酸环己烷二亚甲基酯）-共-聚（对苯二甲酸乙二醇酯），其包含大于50mol %至99 · 9mo 1 %的聚（1，4-对苯二甲酸环己烧二亚甲基酯）（PCTG);聚(对苯二甲酸环己烷二亚甲基酯)-共-聚(对苯二甲酸乙二醇酯），其包含大于50mol%至99.9mol%的聚（对苯二甲酸乙二醇酯）（PETG);或聚（对苯二甲酸五螺环二醇酯)_共-聚(对苯二甲酸乙二醇酯）。可以使用包含一种或多种的前述聚酯或共聚酯的组合。  The inner layer may comprise a polyester (e.g., polyethylene terephthalate polyethylene naphthalate (PEN) or polyethylene glycol furan dicarboxylate (PEF)), copolyesters of terephthalic acid (e.g., poly (polyparaphenylene acid 2,2,4,4-tetramethyl-1,3-butylene terephthalate) - co - poly (cyclohexane-dimethylene terephthalate ester) (PTCC); poly (terephthalate acid cyclohexanedimethylene terephthalate) - co - poly poly (ethylene terephthalate), which comprises greater than 50mol% to 99 · 9mo 1% of (1,4-cyclohexylene terephthalate burn dimethylene terephthalate) (PCTG); poly (cyclohexane-dimethylene terephthalate terephthalate) - co - poly (ethylene terephthalate), which comprises greater than 50mol% to 99.9mol% of poly (ethylene terephthalate) (PETG);. or poly (spiro five terephthalate glycol ester) _ co - poly (ethylene terephthalate) can contain one or more of the polyester or copolyester composition. 内层可以包含衍生自对苯二甲酸、可选的不同于对苯二甲酸的二羧酸，与两种或更多种二醇的对苯二甲酸共聚酯。  The inner layer may comprise units derived from terephthalic acid, optionally different from the dicarboxylic acid is terephthalic acid, and two or more diols terephthalate copolyester. 不同于对苯二甲酸的二羧酸可以包含具有多达20个碳原子的芳香族二羧酸残基(如间苯二甲酸、4，4/-联苯基二羧酸、萘二羧酸、和反式4，4 /-芪二羧酸）、具有多达16个碳原子的脂肪族二羧酸残基(如环己烷二羧酸以及丙二酸、琥珀酸、戊二酸、己二酸、庚二酸、辛二酸、壬二酸和十二烷二羧酸）、或包含前述中的一种或两种的组合。 Dicarboxylic acid different from terephthalic acid may include aromatic dicarboxylic acid residues (e.g., isophthalic acid having up to 20 carbon atoms, 4,4 / - biphenyl dicarboxylic acid, naphthalene dicarboxylic acid , and trans 4,4 / - stilbene dicarboxylic acid), aliphatic dicarboxylic acid residues having up to 16 carbon atoms (e.g., cyclohexane dicarboxylic acid, and malonic acid, succinic acid, glutaric acid, adipic acid, pimelic acid, suberic acid, azelaic acid, and dodecane dicarboxylic acid), or a combination thereof comprising one or two. 二羧酸可以包含茚满二羧酸，例如，茚满-1，3-二羧酸和/或苯基茚满二羧酸，具体地，1， 2，3-三甲基-3-苯基茚满-4'5-二羧酸和1，1，3-三甲基-5-羧基-3- (4-羧基苯基)茚满二羧酸。 Indan dicarboxylic acids may comprise dicarboxylic acids, e.g., indan-1,3-dicarboxylic acid and / or phenyl indan dicarboxylic acids, in particular, 1, 2,3-trimethyl-3-phenylmethyl yl and indan -4'5- dicarboxylic acid 1,1,3-trimethyl-5-carboxy-3- (4-carboxyphenyl) indan dicarboxylic acid. 应该理解的是，在本文中提到衍生自“酸”的聚酯包括衍生自酸的相应的活性衍生物的聚酯，包括相应的烷基或苯基酯、盐、或羰基卤化物，例如，对苯二甲酸二甲酯或对苯二酰氯（1，4-苯二碳酰氯）。 It should be understood that, as referred to herein is derived from a polyester "acid" include polyesters derived from a corresponding reactive derivative of the acid, including the corresponding alkyl or phenyl ester, salt thereof, or a carbonyl halide, e.g. , dimethyl terephthalate, terephthaloyl chloride or (1,4-terephthaloyl chloride). 在一些实施方式中，羧酸的酯和/或盐可以用来代替二羧酸。 In some embodiments, the esters of carboxylic acids and / or dicarboxylic acid salts may be used instead. 二羧酸酯的实例包括二甲基、二乙基、二丙基、二异丙基、二丁基和二苯基酯。 Examples of dicarboxylic acid esters include dimethyl, diethyl, dipropyl, diisopropyl, dibutyl, and diphenyl esters. 基于二羧酸的总摩尔数，二羧酸可以包含70至100摩尔百分比(mol%)的对苯二甲酸;0至30mol %的具有多达20个碳原子的芳香族二羧酸；和0至IOmol %的具有多达16个碳原子的脂肪族二羧酸。  Based on the total moles of dicarboxylic acid, the dicarboxylic acid can comprise 70 to 100 mole percentages (mol%) of terephthalic acid; 0 to 30mol% having up to 20 carbon atoms, an aromatic dicarboxylic acid ; IOmol% to 0 and having up to 16 carbon atoms, an aliphatic dicarboxylic acid. 两种或更多种二醇可以包含2,2,4,4_四甲基-1，3-环丁二醇、环己烷二甲醇、乙二醇、二乙二醇、1，2-丙二醇、1，3-丙二醇、新戊二醇、1，4-丁二醇、1，5-戊二醇、1，6-己二醇、 对二甲苯二醇、聚四亚甲基二醇、2，2-二甲基-1，3-丙二醇、3，9-二（1-1-二甲基-2-羟基乙基)-2,4,8，10-四氧杂螺[5,5]十一烷（“螺环二醇”）等。  two or more diols may contain 2,2,4,4_ tetramethyl-1,3-cyclobutanediol, cyclohexanedimethanol, ethylene glycol, diethylene glycol, 1 , 2-propanediol, neopentyl glycol, 1,4-butanediol, 1,5-pentanediol, 1,6-hexanediol, p-xylene glycol, polytetramethylene glycol, 2,2-dimethyl-1,3-propanediol, 3,9-bis (1-1- dimethyl-2-hydroxyethyl) -2,4,8,10-tetraoxa spiro [5,5] undecane ( "spiroglycol") and the like. 环己烷二甲醇可以是其顺式、反式、 或它们的混合物。 Cyclohexanedimethanol may be cis, trans, or a mixture thereof. 例如，顺式:反式环己烷二甲醇的比率可以是60:40至40:60或70:30至30: 70。 For example, cis: trans cyclohexanedimethanol methanol ratio may be 60:40 to 40:60 or 70:30 to 30: 70. 在乙二醇中可以存在环己烷二甲醇的1，1-、1，2-、1，3-、1，4-异构体或它们的混合物。 Cyclohexanedimethanol can be present in ethylene glycol 1,1-, 1,2-, 1,3-, 1,4-isomers or mixtures thereof. 环己烷二甲醇可以包含1，4_环己烷二甲醇和1，3_环己烷二甲醇、或包含前述中的一种或两种的组合。 Cyclohexanedimethanol may comprise 1,4_ 1,3_ cyclohexanedimethanol and cyclohexanedimethanol, or a combination of the foregoing containing one or two. 环己烷二甲醇可以包含1，4_环己烷二甲醇(CHDM)。 Cyclohexanedimethanol may comprise 1,4_ cyclohexanedimethanol (CHDM). 基于二醇的总摩尔数，两种或更多种二醇可以包含1至99mol%的2,2,4,4_四甲基-1，3-环丁二醇和1至99mol%的1，4_环己烧二甲醇或80至99mol%，具体地，85至98mol% 的2，2，4，4_四甲基-1，3-环丁二醇和1至20mol %的第二种二醇。  Based on the total moles of diols, of two or more diols can contain from 1 to 99mol% of 2,2,4,4_ tetramethyl-1,3-cyclobutanediol and 1 to 99mol% 1,4_ burning of cyclohexyl dimethanol or 80 to 99mol%, specifically, 85 to 98mol% of 2,2,4,4_ tetramethyl-1,3-cyclobutanediol and 1 to 20mol% of two kinds of diol. 第二种二醇可以包含乙二醇、环己烷二甲醇、或包含前述中的至少一种的组合。 The second glycol may comprise ethylene glycol, cyclohexane dimethanol, or a combination comprising at least one of the foregoing. 可替换地，至少两种二醇可以包含1至99mol%的乙二醇和1至99mol%的1,4-环己烷二甲醇。  Alternatively, the at least two diols may contain from 1 to 99mol% of ethylene glycol and 1 to 99mol% of 1,4-cyclohexanedimethanol. 例如，各自基于二醇的总摩尔数，两种或更多种二醇可以包含大于50至99mol%， 具体地55至90mol%的环己烷二甲醇（具体地，CHDM)和1至小于50mol%，具体地10至49mol %的乙二醇。 For example, each based on the total moles of diol, two or more glycols may comprise more than 50 to 99 mol%, in particular 55 to 90mol% of cyclohexane dimethanol (in particular, of CHDM) and from 1 to less than 50mol %, in particular 10 to 49mol% of ethylene glycol. 可替换地，两种或更多种二醇可以包含1至小于50mol %，具体地10至49mol%的环己烧二甲醇(具体地CHDM)，和大于50至99mol%或51至90mol%的乙二醇。 Alternatively, two or more diols can contain from 1 to less than 50 mol%, in particular 10 to 49mol% burn cyclohexyl dimethanol (particularly of CHDM), and 50 to 99mol% or greater than 51 to 90mol% of glycol. 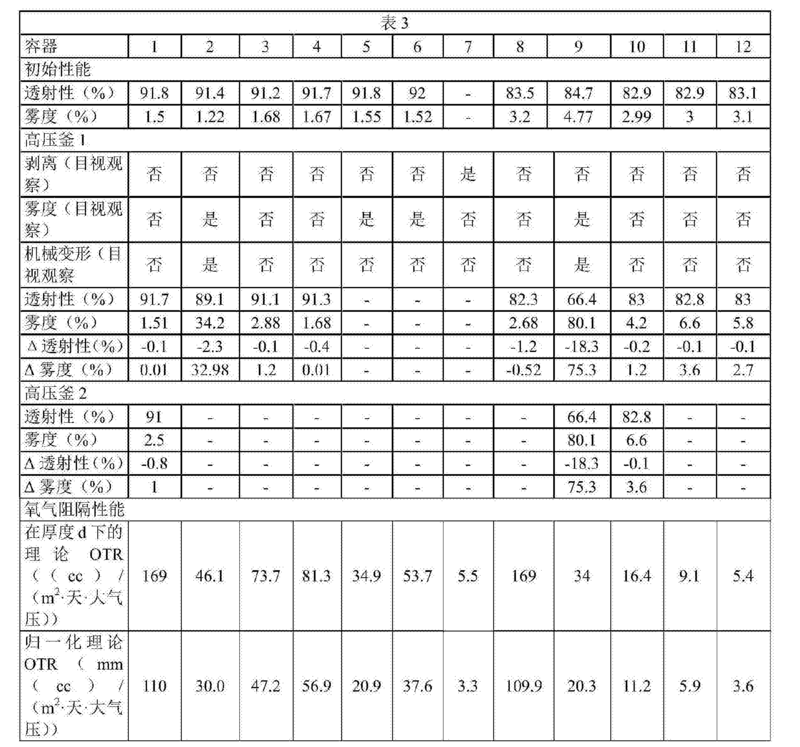 和30至90mol %的乙二醇。  and 30 to 90mol% of ethylene glycol. 螺环二醇共聚酯可以进一步衍生自二羧酸组分，其包含80至IOOmol %的对苯二甲酸和0至30mol %，或大于0至30mol %，的可选的如前文描述的不同于对苯二甲酸的二羧酸，例如O至30mol %的具有多达20个碳原子的芳香族二羧酸或O至IOmol %的具有多达16个碳原子的脂肪族二羧酸;各自基于二羧酸的总摩尔数。 Spiroglycol copolyester may further be derived from dicarboxylic acid component comprising 80 to IOOmol% of terephthalic acid and optionally 0 to 30mol%, or greater than 0 to 30mol%, as described hereinbefore different dicarboxylic acid in the terephthalic acid, such as an O to 30mol%, or aromatic dicarboxylic acid having up to 20 carbon atoms and O to IOmol% of aliphatic dicarboxylic acids having up to 16 carbon atoms; each total number of moles based on the dicarboxylic acid. 例如，二羧酸组分可以进一步包含间苯二甲酸、苯二甲酸、2-甲基对苯二甲酸、萘二羧酸、联苯基二羧酸、四氢化萘二羧酸、琥珀酸、戊二酸、己二酸、庚二酸、辛二酸、壬二酸、癸二酸、十二烷二羧酸、环己烷二羧酸、十氢化萘二羧酸、降冰片烷二羧酸、三环癸烷二羧酸、五环十二烷二羧酸、异佛尔酮二羧酸、3，9-二(2-羧基乙基)-2，4，8，10-四氧杂螺[5.5] ^烷、偏苯三酸、均苯三酸、苯均四酸、丙三羧酸、或包含前述中的至少一种的组合。 For example, the dicarboxylic acid component may further comprise isophthalic acid, phthalic acid, 2-methyl terephthalic acid, naphthalene dicarboxylic acid, biphenyl dicarboxylic acid, tetralin dicarboxylic acid, succinic acid, glutaric acid, adipic acid, pimelic acid, suberic acid, azelaic acid, sebacic acid, dodecane dicarboxylic acid, cyclohexane dicarboxylic acid, decalin dicarboxylic acid, norbornane dicarboxylic acid, tricyclodecane dicarboxylic acid, dodecane dicarboxylic acid rings, isophorone dicarboxylic acid, 3,9-bis (2-carboxyethyl) -2,4,8,10-tetraoxa a combination of at least one hetero-spiro [5.5] ^ alkoxy, trimellitic acid, trimesic acid, pyromellitic acid, malonic acid, or containing the foregoing. 以高达二醇组分的30mol% 的量，二醇组分可以进一步可选地包含Ci-6脂肪族二醇、聚(&amp;-4亚烷基）乙二醇、三价或更高价的多元C2-12醇、C3-6脂环族二醇、双酚的&amp;-6氧化烯加合物、C6-18芳香族二羟基化合物的&amp;-6 氧化烯加合物、或包含前述中的至少一种的组合。 In an amount up to 30mol% of the diol component, the diol component may further optionally comprise Ci-6 aliphatic diol, poly (& amp; -4 alkylene) glycol, a trivalent or higher C2-12 polyhydric alcohol, a C3-6 alicyclic diol, bisphenols & amp; -6 alkylene oxide adducts, (6-18C) an aromatic dihydroxy compound & amp; -6 alkylene oxide adduct, or comprising the at least one combination. 内聚酯可以包含聚萘二甲酸乙二醇酯，其至少衍生自乙二醇和萘-2,6-二羧酸。  The polyester may comprise inner polyethylene naphthalate, polyethylene terephthalate, at least derived from ethylene glycol and naphthalene-2,6-dicarboxylic acid. 内聚酯可以包含大于或等于SOmol %的亚乙基-2，6_萘二甲酸酯的重复单元，具体地，85至lOOmol%的亚乙基-2,6-萘二甲酸酯的重复单元。 The polyester may comprise -2,6_ ethylene naphthalate repeat units of greater than or equal SOmol%, specifically, 85 to lOOmol% ethylene 2,6-naphthalene dicarboxylate repeating units. 聚萘二甲酸乙二醇酯可以进一步包含重复单元，其衍生自萘-2,7-二羧酸酯、萘-1，5-二羧酸酯、萘-1，7-二羧酸酯、对苯二甲酸、间苯二甲酸、二苯基二羧酸、二苯氧基羧酸、二苯醚二羧酸、二苯砜二羧酸、己二酸、癸二酸、壬二酸、对羟基乙氧基苯甲酸、ε_氧基己酸、亚丙基二醇、四亚甲基二醇、六亚甲基二醇、十亚甲基二醇、新戊二醇、二亚乙基乙二醇、1-环己烷二甲醇、1，4-环己烷二甲醇、2，2-二(4 ' -β-羟基苯基)丙烷、二(4'-β-羟基乙氧基苯基)磺酸、或包含前述中的至少一种的组合。 Polyethylene naphthalate, polyethylene terephthalate may further comprise repeating units derived from 2,7-dicarboxylate, naphthalene-1,5-dicarboxylate, naphthalene-1,7-dicarboxylate, terephthalic acid, isophthalic acid, diphenyl dicarboxylic acid, diphenoxyethane carboxylic acid, diphenylether dicarboxylic acid, diphenyl sulfone dicarboxylic acid, adipic acid, sebacic acid, azelaic acid, of acid-hydroxyethoxy, ε_ group hexanoic acid, trimethylene glycol, tetramethylene glycol, hexamethylene glycol, decamethylene glycol, neopentyl glycol, diethylene group ethylene, 1-cyclohexanedimethanol, 1,4-cyclohexanedimethanol, 2,2-bis (4 '-β- hydroxyphenyl) propane, bis (4'-β- hydroxyethoxy phenyl) sulfonic acid, or a combination comprising at least one of the foregoing. 内聚酯可以包含聚呋喃二甲酸乙二醇酯。  The polyester may comprise the polyfuran polyethylene terephthalate. 通过包含乙二醇的二醇组分和包含2,5_ 呋喃二羧酸的二羧酸组分的反应来衍生聚呋喃二甲酸乙二醇酯。 Glycol esters by reacting a diol component comprising ethylene glycol and a dicarboxylic acid comprising 2,5_ furan dicarboxylic acid component derivatized polyethylene furan dicarboxylate. 基于二醇组分的总摩尔数，亚乙基二醇组分可以进一步包含0至20mol %的另一种乙二醇，例如，2，2，4，4-四甲基-1，3-环丁二醇、环己烷二甲醇（具体地，CHDM)、二乙二醇、1，2-丙二醇、1，3-丙二醇、新戊二醇、1，4-丁二醇、1，5-戊二醇、1，6-己二醇、对二甲苯二醇、聚四亚甲基二醇、2，2-二甲基-1， 3-丙二醇或包含前述中的至少一种的组合。 Based on the total moles of the diol component, ethylene glycol component may further comprise from 0 to 20 mol% of another glycol, e.g., 2,2,4,4-tetramethyl-1,3 cyclobutanediol, cyclohexanedimethanol (in particular, of CHDM), diethylene glycol, 1,2-propanediol, 1,3-propanediol, neopentyl glycol, 1,4-butanediol, 1,5 - pentanediol, 1,6-hexanediol, p-xylene glycol, polytetramethylene glycol, 2,2-dimethyl-1,3-propanediol or at least one of the foregoing contains . 二羧酸组分可以进一步包含0至20mol%的另一种二羧酸，例如，对苯二甲酸、间苯二甲酸、苯二甲酸、2-甲基对苯二甲酸、萘二羧酸、联苯基二羧酸、四氢化萘二羧酸、琥珀酸、戊二酸、己二酸、庚二酸、辛二酸、壬二酸、癸二酸、十二烷二羧酸、环己烷二羧酸、十氢化萘二羧酸、降冰片烷二羧酸、三环癸烷二羧酸、异佛尔酮二羧酸、五环十二烷二羧酸、3，9-二(2-羧基乙基)-2，4，8，10-四氧杂螺[5.5] ^烷、偏苯三酸、 均苯三酸、苯均四酸、丙三羧酸、或包含前述中的至少一种的组合。 Dicarboxylic acid component may further comprise from 0 to 20 mol% of another dicarboxylic acid, e.g., terephthalic acid, isophthalic acid, phthalic acid, 2-methyl terephthalic acid, naphthalene dicarboxylic acid, biphenyl dicarboxylic acid, tetralin dicarboxylic acid, succinic acid, glutaric acid, adipic acid, pimelic acid, suberic acid, azelaic acid, sebacic acid, dodecane dicarboxylic acid, cyclohexyl alkyl dicarboxylic acid, decalin dicarboxylic acid, norbornane dicarboxylic acid, tricyclodecane dicarboxylic acid, isophorone dicarboxylic acid, dodecane dicarboxylic acid rings, 3,9-bis ( 2-carboxyethyl) -2,4,8,10-tetraoxa-spiro [5.5] ^ alkoxy, trimellitic acid, trimesic acid, pyromellitic acid, malonic acid, or containing the foregoing at least one combination. 对苯二甲酸共聚酯（例如，PTTC、PCTG、PETG、或螺环二醇共聚酯）可以具有：110至200°C的Tg和如在25°C下在0.5克/100毫升的浓度下在60:40 (wt: wt)的苯酚：四氯乙烷溶液中确定的0.35至小于0.70分升/克(dL/g)的固有粘度的一种或两种。  The copolyester of terephthalic acid (e.g., PTTC, PCTG, PETG, or copolyester spiroglycol) may have: Tg 110 to to 200 ° C and 25 ° C for as 0.5 g / 100 determining one or both of tetrachloroethane solution of 0.35 to less than 0.70 dl / gram (dL / g) intrinsic viscosity: concentration under mL 60:40 (wt: wt) phenol. 其中R1基团的总数的至少60%是芳香族的，或每个R1含有至少一个C6-3Q芳香族基团。  wherein at least 60% of the total number of R1 groups are aromatic, containing at least one or each R1 C6-3Q aromatic group. 聚碳酸酯和它们的制造方法是本领域中已知的，其描述于，例如，WO 2013/175448AUUS 2014/0295363、和WO 2014/072923。 Polycarbonates and their method of manufacture are known in the art, which is described in, e.g., WO 2013 / 175448AUUS 2014/0295363, and WO 2014/072923. 聚碳酸酯通常制造自双酚化合物如2,2-二(4-羟基苯基)丙烷（“双酚A”或“BPA”）、3,3-二(4-羟基苯基）苯并吡咯酮、1，1-二(4-羟基-3-甲基苯基)环己烷、或1，1-二(4-羟基-3-甲基苯基)-3，3,5_三甲基环己烷，或还可以使用包含至少一种前述双酚化合物的组合。 Polycarbonates are generally manufactured from a bisphenol compound such as 2,2-bis (4-hydroxyphenyl) propane ( "bisphenol A" or "BPA"), 3,3- bis (4-hydroxyphenyl) phthalimidine ketone, 1,1-bis (4-hydroxy-3-methylphenyl) cyclohexane, or 1,1-bis (4-hydroxy-3-methylphenyl) trimethyl -3,3,5_ cyclohexane, or it may further comprise using at least one of the foregoing bisphenol compounds. 聚碳酸酯可以是均聚物，其衍生自BPA;共聚物，其衍生自BPA 和另一种双酚或二羟基芳香族化合物如雷琐酚;或共聚物，其衍生自BPA和可选的另一种双酸或二轻基芳香族化合物，以及进一步包含非碳酸酯单元，例如，芳香族酯单元如雷琐酸对苯二甲酸酯或间苯二甲酸酯，芳香族-脂肪族酯单元，其基于C6-2Q脂肪族二元酸、聚硅氧烷单元如聚二甲基硅氧烷单元、或包含前述中的至少一种的组合。 The polycarbonate may be a homopolymer, derived from BPA; copolymers derived from BPA and another bisphenol compound or a dihydroxy aromatic thunder resorcinol; or copolymer derived from BPA and optional another diacid or di light aromatic compound, and phthalate or isophthalate, further comprising a non-aromatic carbonate units, e.g., the aromatic acid ester unit of thunder Suo - aliphatic ester unit, based C6-2Q aliphatic dibasic acids, polysiloxanes such as polydimethyl siloxane units units, comprising at least one or a combination of the foregoing. 其它聚碳酸酯还可以用于本文提供的第二层。  Other polycarbonates may also be used for a second layer provided herein. 例如，并且不应被解释为限制性的， 按照于2013年5月2日公开的PCT公开的申请号WO 2013/061274A1制备自具有降低的硫含量的双酚A的聚碳酸酯可以用于本文公开的聚碳酸酯材料。 For example, and it should not be interpreted as limiting, in accordance May 2, 2013 disclosed in PCT Application No. WO 2013 / 061274A1 polycarbonate prepared from bisphenol A having a reduced sulfur content disclosed herein may be used disclosed polycarbonate material. 按照PCT公开的申请号WO 2013/ 061274A1形成的聚碳酸酯可以用于本文公开的内层以形成容器如瓶、碗、储存容器、锅、等等。 A polycarbonate disclosed in PCT Application No. WO 2013 / 061274A1 may be used to form the inner disclosed herein to form a container such as a bottle, bowl, storage containers, pots, and the like. 除上文描述的用于第二层的聚碳酸酯之外，还可以单独或与聚酯组合地使用聚碳酸酯与其它热塑性聚合物的组合，例如，均聚碳酸酯或聚碳酸酯共聚物（例如，聚酯-碳酸酯)。  In addition to the polycarbonate for the second layer described above, but also may be used alone or in combination with the polyester polycarbonate used in combination with other thermoplastic polymers, e.g., polycarbonate or polycarbonate are ester copolymers (e.g., polyester - carbonate). 其中J是衍生自二羟基化合物(其包括其反应性衍生物)的二价基团，并且可以是， 例如，C2-K)亚烷基、C6-2Q亚环烷基、C6-2Q亚芳基、或聚氧化亚烷基，其中亚烷基含有2至6个碳原子，具体地，2、3、或4个碳原子；以及T是衍生自二羧酸(其包括其反应性衍生物)的二价基团，并且可以是例如C2-2Q亚烷基、C6-2Q亚环烷基、或C6-2Q亚芳基。  wherein J is derived from a dihydroxy compound (including a reactive derivative thereof) a divalent group, and may be, for example, C2-K) alkylene, C6-2Q cycloalkylene, C6- 2Q arylene group, or a polyoxyalkylene wherein the alkylene group contains from 2 to 6 carbon atoms, specifically 2, 3, or 4 carbon atoms; and T is derived from a dicarboxylic acid (which comprises the reaction derivative) a divalent group and may be, for example, alkylene C2-2Q alkyl, C6-2Q cycloalkylene, arylene or C6-2Q. 可以使用含有不同T和/或J 基团的组合的共聚酯。 The copolyester may be used comprising a combination of different T and / or J groups of. 聚酯单元可以是支链或线性的。 Polyester unit may be branched or linear. 当共混时，本文中所描述的第二聚酯一般完全混溶与聚碳酸酯。 When blended, the second polyester as described herein are generally completely miscible with the polycarbonate. 聚碳酸酯和第二聚酯的重量比可以是100:0至1:99,具体地，1: 99 至99:1，更具体地，20:80 至80:20或100:0 至80:20。 A second weight of the polycarbonate and polyester ratio may be 100: 0 to 1:99, particularly 1: 99 to 99: 1, more particularly 20: 80 to 80:20 or 100: 0 to 80: 20. 第二层可以包含再生或再研磨材料。  The second layer may comprise regrind or regenerated. 例如，用于容器的再生材料可以包括如上文描述的那些聚碳酸酯和聚酯的共混物。 For example, the container for the recycled material may include those of polycarbonate and polyester blends as described above. 在某些应用如饮料瓶(例如，水瓶）中再生材料的使用可以是所期望的，并且可以有利于材料成本的降低。 Use of recycled materials in certain applications, such as a beverage bottle (e.g., bottle) may be desirable, and may help to reduce the material cost. 例如，再生材料可以包含来自再研磨或回收多层水瓶的回收聚碳酸酯和回收聚酯（如聚碳酸酯和对苯二甲酸共聚酯如PTTC、 PETG、或PCTG，或聚碳酸酯和五螺环二醇共聚酯的共混物）。 For example, recycled material may comprise recycled polyester polycarbonate and recovered from the multilayer bottle reground or recycled (e.g., polycarbonate and copolyesters such as terephthalic PTTC, PETG, or PCTG, and five or polycarbonate spiroglycol copolyester blend). 应注意的是，在第二层中再生材料的量可以有所不同，其取决于容器的预期用途。 It should be noted that the amount of recycled material in the second layer may vary, depending on the intended use of the container. 例如，基于热塑性组合物的总重量，第二层可以包含10至100»1:%，具体地，30至70¥1:%新聚碳酸酯；0至80¥1:%，具体地，0至50¥1:% 的新聚酯；以及〇至80wt%，具体地，30至70wt%的回收聚酯和/或回收聚碳酸酯。 For example, based on the total weight of the thermoplastic composition, the second layer may comprise 10 to 100 »1:%, in particular 30 to 70 ¥ 1: New% polycarbonate; ¥ 80 0 to 1:%, particularly, 0 to 50 ¥ 1:% new polyester; and a square to 80wt%, particularly, 30 to 70wt% of recycled polyester and / or polycarbonate recovery. 例如，基于组合物的总重量，用于第二层的热塑性组合物可以包含10至l〇〇wt%新聚碳酸酯；和大于0 至80wt%的新聚酯;和/或大于0至80wt%的回收聚酯和/或回收聚碳酸酯。 For example, based on the total weight of the composition, the thermoplastic composition for the second layer may comprise 10% to l〇〇wt new polycarbonate; and a new polyester are of more than 0 to 80wt%; and / or greater than 0 to 80wt % of recycled polyester and / or polycarbonate recovery. 这样的百分比可以依赖于所期望的性能，例如，透明度和/或所期望的阻隔性能(对于适当的保质期）。 This percentage may depend on the desired properties, e.g., transparency and / or desired barrier properties (for proper shelf life). 本文公开的容器的第二层可以形成自，例如可获自SABIC' s Innovative Plastics business的LEXAN™PK2870树脂。  The container disclosed herein, the second layer may be formed from, for example, available from SABIC 's Innovative Plastics business of LEXAN ™ PK2870 resin. 这样的材料可以特别有用于挤出吹塑应用。 Such materials may be particularly useful for extrusion blow molding applications. 这种材料可以具有优良的物理性能，包括:按照ASTM Dl238-04，在300 °C下并在1.2千克(kg)的负载下测得的2至15的熔体体积速率(MVR)，更具体地，2至9立方厘米(cm3) /10分钟。 Such material may have excellent physical properties, comprising: in accordance with ASTM Dl238-04, and measured at 1.2 kilograms (kg) load at 300 ° C a melt volume rate of 2 to 15 (the MVR), more particularly , the 2-9 cubic centimeters (cm3) / 10 min. 第二层可以进一步具有按照ASTM D648使用3.2mm厚的模塑棒并在0.45兆帕(MPa) 下所测得130至160°C，更具体地140至145°C的热变形温度(HDT)。  The second layer may further have used 3.2mm thick molded bars according to ASTM D648 and measured 130. to 160 ° C at 0.45 megapascals (MPa), heat distortion temperature of 140 is more specifically 145 ° C to the (HDT). 第二层可以进一步具有按照ISO 179/leA在23°C下的30至80千焦耳/平方米（kj/m2)的简支梁缺口冲击（Charpy Notched Impcht)。 The second layer may further accordance with ISO 179 / leA 30 to 80 kJ / m² (kj / m2) Charpy Notched Impact is at 23 ° C for the (Charpy Notched Impcht). 第二层可以进一步具有按照ISO 180/1A在23°C下50至80kJ/m2的悬臂梁式带缺口冲击。 The second layer may further accordance with ISO 180 / 1A notched Izod at 23 ° C 50 to 80kJ / m2 impact. 第二层可以具有大于或等于75%、或大于或等于90%、或大于或等于95%的透明度。 The second layer may be greater than or equal to 75%, or greater than or equal to 90%, or greater than or equal to 95% transparency. 聚碳酸酯可以包含PK2870-BL8E055T (其是蓝色等级）并具有按照ASTM D1003在BYK Dual Haze防护装置上所测得的分别为83.5%和3.2%的透射和雾度。  The polycarbonate may comprise PK2870-BL8E055T (which is a blue scale), and in accordance with ASTM D1003 on a BYK Dual Haze guard measured 83.5% and 3.2%, respectively, of the transmission and haze. 天然聚碳酸酯等级卩1(2870-11204具有按照43了]\101003在8¥1(0皿1他26防护装置上所测得的分别为91.4% 和3.48 %的透射和雾度。 Level 1 Jie natural polycarbonate (2870-11204 accordance with the 43] \ 101003 in 8 ¥ 1 (0 1 on his dish guard 26 measured 91.4% and 3.48%, respectively, of the transmission and haze. 多层材料可以是双层（仅包含两层）或可以具有多于两层。  The multilayer may be a double material (comprising only two layers) or may have more than two layers. 例如，多层制品可以包含聚酯第三层，其可以包含与内层相同或不同的聚酯。 For example, the multilayer articles may comprise a third layer of polyester, an inner layer which may comprise the same or different polyesters. 可以使用晶体聚酯以例如为非透明的应用等实现更高的耐化学性。 Crystal polyester may be used to achieve other non-transparent applications such as higher chemical resistance. 第三层可以包含聚对苯二甲酸乙二醇酯。 The third layer may comprise polyethylene terephthalate. 第三层可以是外层。 The third layer may be an outer layer. 进一步地，多层材料可以包含粘附层(还称为连接层(tie layer))，其定位在两层之间，例如，在第二层与内层和第三层的一个或两者之间。  Further, the adhesive layer may comprise a multilayer material (also referred to as a connection layer (tie layer)), positioned between the two layers, e.g., with the inner layer and the second layer or a third layer between the two. 可以包括粘附层以改善在两层之间的粘附并且可以加以形成使得在层的正常使用条件下没有分层，即，不发生分层。 It may include an adhesive layer to improve adhesion between the two layers and may be formed such that no delamination under normal use conditions in the layer, i.e., delamination does not occur. 例如， 如果多层材料包含第三层以致聚碳酸酯第二层位于在第一聚酯内层和第三层(例如，聚酯第三层)之间，则粘附层可以位于在第二层与内层和第三层之一或两者之间。 For example, if the multilayer material comprises a third layer such that the second layer is a polycarbonate of the first inner polyester layer and the third layer (e.g., a third layer of polyester) between the second adhesive layer may be located one of the inner layer and the third layer, or between the two. 连接层可以包含聚酯、聚乙稀、聚氨酯、聚丙稀酸(polyacrylic)、或包含前述中的至少一种的组合。 Tie layer may comprise polyester, polyethylene, polyurethane, polyacrylic acid (Polyacrylic), comprising at least one or a combination of the foregoing. 连接层可以包含共聚物，其包含聚乙烯、聚氨酯、聚丙烯酸类、或包含前述中的至少一种的组合。 Tie layer may comprise a copolymer comprising polyethylene, polyurethane, polyacrylic, or a combination comprising at least one of the foregoing. 粘附层可以形成自聚碳酸酯-聚酯共混材料如XYLEX™ X8409AC，其可商购自SABIC' s Innovative Plastics business。 The adhesion layer may be formed from a polycarbonate - polyester blend material such as XYLEX ™ X8409AC, which is commercially available from SABIC 's Innovative Plastics business. 多层材料和由其形成的制品可以有利地提供对于应用如饮料瓶(例如，大水瓶、小水瓶、和婴儿奶瓶)所期望的机械强度和热稳定性。  The multilayer materials and products formed therefrom can advantageously be provided for applications such as beverage bottles (e.g., large bottles, small bottles, and baby bottles) desired mechanical strength and thermal stability. 例如，多层材料可以承受50个使用90°C 的热水的洗涤循环（更具体地，100个洗涤循环）并且可以通过在120°C下高压灭菌30分钟(具有水分以及在2巴压力下）加以消毒，同时保持大于或等于80%的透明度，具体地，大于或等于90%，或大于或等于95%。 For example, the multilayer material can withstand washing cycle using 50 to 90 ° C hot water (more specifically, 100 wash cycles) and can be water at a pressure of 2 bar and 120 ° C for 30 minutes autoclave (having be lower) disinfection, while maintaining greater than or equal to 80% of transparency, specifically, greater than or equal to 90%, or greater than or equal to 95%. 如在本文中所使用的，保持透明度是指小于或等于5%的透明度的降低，具体地，小于或等于3%，更具体地，小于或等于1%，以及甚至更具体地，透明度没有降低。 As used herein, the transparency means less than or equal to 5% reduction of transparency, specifically, less than or equal to 3%, more specifically, less than or equal to 1%, and even more particularly, the transparency does not decrease . 如在本文中所使用的，除非具体地另有说明，按照ASTM D-1003-00 (程序A， 分光光度计，利用具有漫射照明的施照体C，借助于单向观察），并使用2.5毫米(mm)试验样板来测量透明度。 As used herein, unless specifically stated otherwise, according to ASTM D-1003-00 (procedure A, a spectrophotometer using Illuminant C with diffuse illumination by means of one-way viewer), and using 2.5 millimeters (mm) to measure the test panel transparency. 关于在高温下的尺寸稳定性，可以考虑消毒问题。  For the dimensional stability at high temperatures, the problem can be considered sterilized. 玻璃化转变温度(Tg)是关于热稳定性的因素。 The glass transition temperature (Tg) is a factor concerning the thermal stability. 将聚合物的温度提高至高于和低于聚合物的Tg可以导致雾度、透明度、和尺寸（如x、y、和z尺寸的一种或多种）的一种或多种的潜在损失。 The temperature of the polymer is increased to above and below the Tg of the polymer can result in haze A transparency, and size (e.g., x, y, and z dimensions of one or more) of one or more potential loss. 共聚酯如PETG可以具有81°C 的Tg;PTTC可以具有109°C的Tg;以及聚碳酸酯可以具有143°C的Tg (例如，Lexan™PK2870树脂可以具有150°C的Tg)。 The PETG copolyester may have a Tg 81 ° C; PTTC may have a Tg 109 ° C; and a polycarbonate may have a 143 ° C Tg (e.g., Lexan ™ PK2870 resin may have a Tg 150 ° C). 因此，通过利用如本文公开的多层材料，意外地发现了，可以在110 °(：以上进行高压灭菌和消毒试验，而没有损失透明度并且没有损失尺寸特征，其是由于在多层材料中聚碳酸酯的存在。在消毒期间现在的多层结构可以保持其透明度的事实是特别令人惊讶的，因为聚酯层的Tg—般低于消毒层。不受理论束缚，据信，在内层和第二层之间产生一定的协同作用，其允许多层材料能够保持其透明度和尺寸。 Thus, by using multiple layers of material as disclosed herein, unexpectedly found to be at 110 ° (: autoclaving the above disinfection test and, without loss of the dimensional characteristics and no loss of transparency, which is due to the multi-layer material polycarbonate present. during sterilization multilayer structure may now maintained its transparency fact is particularly surprising, since the polyester layer as below Tg- disinfection layer being bound by theory, it is believed that the inner a certain synergy between the layer and the second layer, which allows the multilayer material capable of maintaining its transparency and size. 在需要消毒或热填充过程的食品包装或保健应用中，在热循环和/或消毒以后的改善的透明度可以是特别有利的。  In the packaging of food or health applications requiring sterilization or hot filling process, transparency thermal cycling and / or improved after sterilization can be particularly advantageous. 为了说明的目的，一些食品制造商仍在使用玻璃罐，这是由于缺乏经济解决方案:更换玻璃，同时在90°C下热填充30分钟以后，或在需要消毒的情况下保持尺寸和透明度特性，例如，通过在120°C下高压灭菌30。 For purposes of illustration, some of the food manufacturers still using glass jars, which is due to the lack of economic Solution: replace the glass, while the hot-fill After 30 minutes, holding the size or characteristics of transparency and in case of need in sterile 90 ° C for , e.g., 30 by autoclaving at 120 ° C. 制造商发现，透明度的降低(例如，材料转为乳白色如由于通过加热所引起的结晶)是不可接受的。 Manufacturers found that the transparency is reduced (e.g., due to the material turned milky as crystallization caused by heat) is unacceptable. 例如，这是果酱容器和番茄酱容器仍然制造自玻璃的压原因。 For example, this is the reason for the pressure vessel jam and ketchup containers still manufactured from glass. 本文公开的容器可以被配置以解决一种或所有这些需求。 Containers disclosed herein may be configured to resolve one or all of these requirements. 在上述热循环和/或消毒以后，可以保持光透射和雾度的一种或两种。  After the heat cycle and / or disinfection, one or both may be kept light transmission and haze. 雾度和光透射可以按照ASTM D1003并用BYK Dual Haze防护装置加以测量。 Haze and light transmittance and can be measured with a BYK Dual Haze guard according to ASTM D1003. 本文公开的多层材料还可以提供足够的水和/或氧气阻挡特性，从而允许这样的制品可以用作容器和/或盖(例如，用于液体、食物、保健产品等等)和其它应用，其中水和/ 或氧气迀移进入容器可能是有害的或导致不良后果。  The multi-layer material disclosed herein may also provide sufficient water and / or oxygen barrier properties, allowing such articles may be used as a container and / or cover (e.g., for liquid, food, health care products, etc.) and other applications, wherein the water and / or oxygen into the container Gan shift may be harmful or result in adverse consequences. 例如，玻璃经常被使用并继续被用于某些食物的存储以减少或消除氧气穿过容器的迀移，从而减少食物腐败。 For example, glass is often used, and continues to be used to store certain foods to reduce or eliminate oxygen through the container Gan shift, thereby reducing spoilage. 可以形成本文公开的制品，例如，容器，以减少氧气迀移进入容器，从而允许包含在其中的食物、液体、或保健产品能够存储足够的时间，并从而提供足够的保质期（例如，超过6个月）。 May be formed article herein disclosed, for example, the container to reduce the oxygen Gan shifted into the container, thereby allowing contained therein food, liquid, or health care product is capable of storing a sufficient time, and thereby provide sufficient shelf life (e.g., over 6 month). 本文公开的容器预计会允许在各种应用中玻璃容器的替代。 Disclosed herein is expected to allow alternative containers in various applications of glass containers. 此外，可以配制用于本文公开的容器的材料以提供所需的性能或特性。  Further, disclosed herein can be formulated for a container of material to provide the desired properties or characteristics. 例如，并且不应被解释为限制性的，如果在容器中的内含物旨在包括具有乙醇的产品，则PETG和/或PCTG可以用作内部材料，因为据信，PETG和PCTG具有耐乙醇化学性。 For example, and should not be construed as limiting of, if the contents in the container are intended to include the product with ethanol, the PETG and / or the interior material may be used as PCTG, as it is believed, PCTG and PETG is resistant to alcohol chemical resistance. 同样，可以考虑其他聚酯材料，其取决于对于特定应用所期望的性能。 Similarly, other polyester materials may be considered, depending on the particular application for the desired performance. 可以按照DIN53380、D3985ASTM、IS0 15105-1、和ISO 15105-2 来测量阻隔性能。  The can according to DIN53380, D3985ASTM, IS0 15105-1, ISO 15105-2, and to measure the barrier properties. 例如，防水性能（在23°C下并在大气压(atm)下，超过24小时(hrs))可以小于或等于4.5克/平方米(g/m2)，具体地，小于或等于4g/m2,更具体地，小于或等于3g/m2,以及甚至小于或等于2g/m2。 For example, (at 23 ° C for at atmospheric pressure and (ATM), more than 24 hours (HRS)) may be less than or equal to the water resistance of 4.5 grams / square meter (g / m2), specifically, less than or equal to 4g / m2, more specifically, less than or equal to 3g / m2, and even less than or equal to 2g / m2. 按照DIN53380,防水性能（在38°C下并在大气压(atm)下，超过24小时（hrs))可以小于或等于9g/m2，具体地，小于或等于7g/m2，更具体地，小于或等于5g/m2，以及甚至小于或等于3g/m2。 According to DIN 53380, water resistance (at 38 ° C and atmospheric pressure (atm) at more than 24 (hrs) h) may be less than or equal to 9g / m2, specifically, less than or equal to 7g / m2, more specifically, less than or equal to 5g / m2, and even less than or equal to 3g / m2. 二氧化碳阻隔性能（在23°C下并在大气压(atm)下，超过24小时）可以是小于或等于25立方厘米/平方米(cm3/m2)，具体地，小于或等于20cm3/m2,更具体地，小于或等于18cm3/ m2,或小于或等于15cm3/m2。  The barrier properties of carbon dioxide (at 23 ° C for at atmospheric pressure and (atm), the more than 24 hours) may be less than or equal to 25 cc / square meter (cm3 / m2), specifically, less than or equal to 20cm3 / m2 more specifically, less than or equal to 18cm3 / m2, or less than or equal to 15cm3 / m2. 阻隔性能可以是特别有利于提高产品的保质期，并且，相对于用于需要这样的阻隔性能的产品的玻璃容器，可以提供替代建造材料。 Barrier properties may be particularly beneficial to improve the shelf life of the product, and, with respect to the need for the barrier properties of the glass container product, it may provide an alternative construction materials. 氧气阻隔性能可以是：（在23 °C下并在大气压(atm)下，超过24小时(hrs))小于或等于7立方厘米/平方米(cm3/m2或cc/m2)的氧气，具体地，小于或等于5cm3/m2，更具体地，小于或等于4cm3/m2,以及甚至小于或等于lcm3/m2。  The oxygen barrier properties may be :( and at 23 ° C for at atmospheric pressure (atm), more than 24 hours (HRS)) is less than or equal to 7 cc / square meter (cm3 / m2 or cc / m2) oxygen , specifically, less than or equal to 5cm3 / m2, more specifically, less than or equal to 4cm3 / m2, and even less than or equal to lcm3 / m2. 多层材料可以具有小于125cc/m2/天大气压的理论氧气转移率，或小于或等于l〇〇cc/m2/天大气压，具体地，小于或等于10. cc/m2/天大气压。 Multilayer material may have less than 125cc / m2 / day theoretical oxygen transfer rate atm, or less than or equal to l〇〇cc / m2 / day atm, specifically, less than or equal to 10. cc / m2 / day atm. 在一些情况下，按照DIN53380、D3985ASTM、和ISO 15105-2,聚酯可以提供聚碳酸酯的三倍的氧气阻隔性能。 In some cases, in accordance with DIN53380, D3985ASTM, and ISO 15105-2, the polyester can provide three times the oxygen barrier properties of the polycarbonate. 基于单个聚酯阻挡层和聚碳酸酯层的氧气渗透性、组成、和厚度，可以估计具有总厚度d的多层结构的理论渗透系数（理论0TR)。  The oxygen permeability of a single polyester-based barrier layer and the polycarbonate layer, composition, and thickness, permeability coefficient can be estimated in theory (Theory 0TR) total thickness d of the multilayer structure. 来自以下处于非取向状态的树脂的以(cc.mm)八天· m2 ·大气压)为单位的氧气渗透值(在括号内所示）用于计算总多层结构的渗透系数（理论0TR):聚碳酸酯（110)、PTTC(30)、PCTG(10)、五螺环二醇共聚酯（10)、PET ⑷、PEF (2)、和PEN (1.8)。 Oxygen permeation values ​​(cc.mm) eight days · m2 · atm) or less as a unit from the resin is in a non-orientation state (shown in brackets) used for permeability coefficient (theoretical 0TR) Calculation of the total multilayer structure: polycarbonate (110), PTTC (30), PCTG (10), five spiroglycol copolyester (10), PET ⑷, PEF (2), and PEN (1.8). 相比于聚酯单层容器，多层容器预计提供改善的强度。  Compared to polyester monolayer container, the container is expected to provide a multilayer improved strength. 例如，聚碳酸酯的弯曲模量可以是大于或等于2,300兆帕（MPa)，而聚酯如PTTC可以表现出仅l，580MPa的弯曲模量， PETG的弯曲模量可以是I，950MPa，PCTG的弯曲模量是I，900MPa，以及PCTA的弯曲模量可以是l，800MPa。 For example, the polycarbonate flexural modulus may be greater than or equal to 2,300 megapascals (MPa), and polyesters such as L only PTTC may exhibit a flexural modulus of 580MPa, flexural modulus may be PETG I, 950MPa, PCTG the flexural modulus is I, 900MPa, PCTA and flexural modulus may be l, 800MPa. 此外，多层容器预计提供改善的UV稳定性和改善的老化，例如，按照IS011341 确定的，相比于某些聚酯单层方法如PTTC，减少在天气循环以后的起雾。 In addition, the multilayer container is expected to provide improved UV stability, and improved aging, e.g., determined in accordance with IS011341, compared to methods such as certain polyesters PTTC monolayer, reduce fogging after weather cycle. 本文提供的多层配置有利地允许以经济的方式来形成容器。  The multilayer configuration provided herein advantageously allow an economical manner to form the container. 取决于所使用的材料成本，例如，提供如本文公开的具有多层配置的水瓶允许第二层包含可以是比聚酯便宜的聚碳酸酯。 Depending on the cost of materials used, e.g., as provided herein disclosed has a multilayer configuration allows the second layer comprises a water bottle may be cheaper than polyester polycarbonates. 在一些应用中，例如，在氧气迀移不是重要因素的情况下，第二层(聚碳酸酯或再生材料)可以是较厚层，从而进一步降低成本同时提供足够的机械强度和热稳定性。 In some applications, for example, in the case of oxygen gas shift Gan not a significant factor, the second layer (polycarbonate or recycled material) may be a thicker layer, thereby further reducing costs while providing sufficient mechanical strength and thermal stability. 现在参照图1A，多层材料10被示出并且包括第二层12和第一层14。  Referring now to FIGS. 1A, the multilayer material 10 is shown and comprises a first layer 12 and second layer 14. 如从IA图可以看出，多层10是双层。 As can be seen from FIG. IA, 10 is a multilayer bilayer. 第二层12至少部分地形成自聚碳酸酯材料并且可以可选地包含再研磨或回收聚碳酸酯和/或聚酯或其他回收塑料材料。 The second layer 12 is at least partially formed from a polycarbonate material and may optionally contain reground or recycled polycarbonate and / or polyester or other recycled plastic materials. 第一层14完全或至少部分地形成自聚酯材料。 The first layer 14 is completely or at least partially formed from a polyester material. 图IB显示多层材料，其具有至少三层20,以及包括第二层12、第一层14、和在第一层14和第二层12之间的粘附层16。 FIG. IB show a multilayer material having at least three layers 20, 12 and comprising a second layer, the first layer 14, and the adhesive layer 16 between first layer 14 and second layer 12. 大容量瓶的实例是大容量瓶30并示于图2。 Examples  is larger capacity and larger capacity 30 shown in FIG. 瓶30可以设计，例如，用作大水瓶，例如，用于分配水。 Bottle 30 can be designed, for example, used as a large bottle, e.g., for dispensing water. 这样的瓶通常容纳数升或加仑(例如，10加仑(37.8升）的水，并且可以连同水分配器一起加以使用。如从图2还可以看出，大容量瓶30形成自聚碳酸酯-聚酯材料10。可替换地，大容量瓶30可以形成自聚碳酸酯-聚酯材料20，如图IB所示。 Such bottles are typically housed in liters or gallons (e.g., 10 gallons (37.8 liters) of water and may be used in conjunction with water dispenser As can also be seen from FIG. 2, is formed from a polycarbonate larger capacity 30 - Poly ester material 10. Alternatively, larger capacity can be formed from polycarbonate 30 - 20 of polyester material, as shown in Figure IB. 饮料瓶的实例是饮料瓶40并且示于图3。 Examples  Beverage bottles and beverage bottles 40 shown in Fig. 如从图3可以看出，饮料瓶40形成自聚碳酸酯-聚酯材料10。 As can be seen from Figure 3, bottles 40 is formed from a polycarbonate - polyester material 10. 可替换地，饮料瓶40可以形成自聚碳酸酯-聚酯材料20,如图IB所示。 Alternatively, the bottles 40 may be formed from a polycarbonate - polyester material 20, as shown in Figure IB. 可以设计饮料瓶40,供个人使用，如水瓶。 40 bottles can be designed for personal use, such as water bottles. 应注意的是，不同于水的液体可以包含在瓶30或40 中（例如，其他饮料(如碳酸饮料)、药品等）。 It is noted that, a liquid other than water may be contained in a bottle 30 or 40 (e.g., other beverages (e.g., carbonated beverages), drugs, etc.). 现在参照图4,食物或保健容器的实例示为食物或保健容器50。  Example 4 Now, referring to FIG container food or health food or health illustrated container 50. 食物或保健容器50 成一定构造以用作食物容器或保健产品容器。 Or health food container 50 into a certain structure for use as food containers or health care product containers. 例如，食物或保健容器50,其形成自聚碳酸酯-聚酯材料10或聚碳酸酯-聚酯材料20,可以用来储存果酱、果冻、或其他食物。 For example, health food or container 50, which is formed from a polycarbonate - polyester or polycarbonate 10 - 20 polyester material, can be used to store jam, jelly, or other food. 可替换地， 可以配置食物或保健容器50以含有保健产品，如化妆水、化妆品、药用产品等。 Alternatively, the container may be configured health food or health products containing 50, such as lotions, cosmetics, pharmaceutical products and the like. 食物或保健容器50可以特别有用于以前已使用或继续使用玻璃罐的应用，和/或如食品包装其中消毒过程是需要的或是期所望的情况下。 Or health food container 50 may be particularly useful to continue using or have used before application of glass jars, and / or as in the case of food packaging where sterilization process is required or desired in the. 本文公开的多层材料的另一种应用包括容器60,配置其以替换聚丙烯(PP)和/或聚苯乙烯(PS)容器。  Another application of the multi-layer material disclosed herein includes a container 60, which is arranged to replace the polypropylene (PP) and / or polystyrene (PS) containers. 更具体地，容器的实例在图5中示为容器60。 More specifically, examples of the container shown in FIG. 5, the container 60. 容器60可以形成自聚碳酸酯-聚酯材料10或聚碳酸酯-聚酯材料20,例如，作为具有大于或等于2层的多层容器。 Polyester or polycarbonate material 10 - - 20 Polyester material, e.g., a multilayered container having a layer of two or more containers 60 may be formed from a polycarbonate. 本文公开的容器60因此可以提供相对于现有聚丙烯(PP)和/或聚苯乙烯(PS)容器的优点，因为PP和PS已经表现出关于水分消毒的不足之处。 Container 60 disclosed herein therefore provide advantages with respect to conventional containers of polypropylene (PP) and / or polystyrene (PS), because PP and PS have been shown on the disinfection of water deficiency. 除图5所示的容器配置之外，容器60可以可替换地以塑料杯等的形状加以配置。 In addition to the configuration of the container shown in FIG. 5, the container 60 may alternatively be arranged in the shape of a plastic cup. 应注意的是，在附图中容器的任何形状仅仅是示例性的而非限制性的。  It should be noted that any shape of the container in the drawings are merely illustrative and not limiting. 容器可以是在容器中可以容纳内含物的任何所需的形状，以及其中第二层没有接触容器中的内含物。 The container may be housed in the container may be any desired shape inclusions, and wherein the second layer not in contact with the container contents. 本文公开的制品和容器的厚度可以不同，其取决于期望的使用和应用，制品的总厚度可以是〇· 4至4mm，具体地，0 · 5至3mm，更具体地，0 · 5至1mm。  The thickness of the article and the container disclosed herein may vary, depending on the desired use and application, the total thickness of the article may be 3.4 billion to 4mm, in particular, 0.5 to 5 3mm, more particularly, 0.5 5 to 1mm. 总厚度可以是1至4mm，具体地，1 · 1至4謹，或1.5至4謹。 The total thickness may be from 1 to 4mm, in particular, 1 · 1-4 honor, or 1.5 to 4 honor. 内层可以是0.05至3.95謹，具体地，0· 1至1謹或0· 1至0.9謹。 Inner layer may wish to be 0.05 to 3.95, in particular, 0 · 1-1 · 0 honor or honor from 1 to 0.9. 内层可以是0 · 1至3 · 95mm，具体地，0 · 2至3 · 95謹，更具体地，1 · 1至3 · 95謹或0 · 2至0 · 5謹。 Inner layer may be from 1 to 3 · 0 · 95mm, in particular 0 · 2 to 3 · 95 wish, more particularly, 1 · 1-3 · 0 · 95, or may wish to 2-0 · 5 honor. 内层与第二层的厚度比可以是1:9至1:1，具体地，1:9至4:6。  The inner layer and the second layer thickness ratio may be 1: 9-1: 1, in particular, 1: 9-4: 6. 可以是所期望的是， 相对于瓶的总厚度，某些瓶(例如，水瓶)具有90%厚度的第二层厚度(形成自，例如，含有聚碳酸酯的材料和/或回收材料），以及，相对于瓶的总厚度，内层具有10%厚度的厚度。 May be desirable that the total thickness of the bottle with respect to some of the bottle (e.g., bottle) having a thickness of 90% of the thickness of the second layer (formed from, for example, a material containing polycarbonate and / or recycled material), and, relative to the total thickness of the bottle, the inner layer having a thickness of 10% of the thickness. 对于其他应用如食品包装和/或保健容器，其中氧气和/或水阻隔性能可以是更重要的，可以期望的是，使用其中内层是比较厚的配置。 Such as food packaging and / or health of the container, wherein the oxygen and / or water barrier properties may be more important for other applications, it may be desirable to use relatively thick inner layer is disposed. 例如，在某些应用中，可以期望的是，相对于瓶的总厚度，具有50%厚度的第二层厚度(形成自，例如，包含聚碳酸酯的材料和/或再生材料），以及，相对于瓶的总厚度，内层具有50%厚度的厚度。 For example, in certain applications, it may be desirable, with respect to the total thickness of the bottle, a second layer having a thickness of 50% of the thickness (formed from, for example, a material comprising a polycarbonate and / or recycled materials), and, with respect to the total thickness of the bottle, the inner layer having a thickness of 50% of the thickness. 可替换地，可以期望的是，相对于瓶的总厚度，具有40%厚度的第二层厚度(形成自，例如，包含聚碳酸酯的材料和/或再生材料），以及，相对于瓶的总厚度，内层具有60 %厚度的厚度。 Alternatively, it may be desirable, with respect to the total thickness of the bottle, a second layer having a thickness of 40% of the thickness (formed from, for example, a material comprising a polycarbonate and / or recycled materials), and, with respect to the bottle the total thickness of the inner layer having a thickness of 60% of the thickness. 为了说明的目的，一个特定实例包括具有Imm的总厚度，其中具有0 · 5mm聚碳酸酯第二层和0.5mm对苯二甲酸共聚酯内层的容器，具体地，PTTC、PCTG、或PETG内层，以及可以具有在一天以后4.2g/m2的水渗透和/或在一天以后57cc/m2的氧气渗透。  For purposes of illustration, a specific example include having a total thickness of Imm, having 0 · 5mm 0.5mm polycarbonate layer and the second vessel inner layer copolyester of terephthalic acid, in particular, PTTC, PCTG or PETG inner layer, and penetration of water after a day 4.2g / m2 and / or after 57cc / m2 of the day may have oxygen permeation. 这样的容器可以为食品包装应用提供适当的阻隔性能以替换玻璃罐(例如，用于果酱、果冻等的包装）。 Such a container may provide suitable barrier properties for the food packaging applications to replace glass jars (e.g., for packaging jam, jelly, etc.). 应注意的是，相对厚度因此可以有所不同，其取决于容器的预期用途和容器的所需性能。 It should be noted that the relative thicknesses and therefore can vary, depending on the desired properties and the intended use of the container the container. 在前述实施方式中，PTTC层是特别有用的。 In the foregoing embodiment, PTTC layer is particularly useful. 多层材料的一层或多层可以包含添加剂，条件是，选择添加剂以不显着不利地影响，例如，以下的一种或多种：水阻隔性能、氧气阻隔性能、和透明度。  one or more layers of the multilayer material may contain additives, with the proviso that the additives are selected so as not to significantly adversely affect, for example, one or more of the following: water barrier properties, oxygen barrier properties, and transparency. 可以在混合用于形成组合物的组分期间的适当的时候混合这样的添加剂。 It may be used in an appropriate time during the mixing of the components forming the composition of such mixing additives. 添加剂包括增强剂、抗氧化剂、热稳定剂、光稳定剂、紫外(UV)光稳定剂、增塑剂、滑润剂、脱模剂、抗静电剂、着色剂如二氧化钛、 炭黑、和有机染料、表面效果添加剂、辐射稳定剂、阻燃剂、和防滴剂。 Additives include reinforcing agents, antioxidants, heat stabilizers, light stabilizers, ultraviolet (UV) light stabilizers, plasticizers, lubricants, mold release agents, antistatic agents, colorants such as titanium dioxide, carbon black, and organic dyes , the surface effect of the additives, radiation stabilizers, flame retardants, and anti-drip agents. 可以使用添加剂的组合。 Combinations of additives may be used. 一般来说，以通常已知有效的量来使用添加剂。 Generally, an effective amount of a generally used known additives. 基于第二层组合物的总重量，添加剂(不同于任何增强剂）的总量通常是0.01至5wt%。 Based on the total weight of the total composition of the second layer, the additives (other than any enhancer) is usually 0.01 to 5wt%. 如前文描述，本文公开的容器可以形成为各种配置。  As previously described, the container disclosed herein may be formed in various configurations. 例如，容器可以是药物、食物、 或饮料容器如瓶，例如，水瓶。 For example, the container may be a drug, food, or beverage containers such as bottles, for example, a water bottle. 瓶的实例包括婴儿奶瓶、饮料瓶(例如，果汁瓶、水瓶、碳酸饮料瓶、酒精饮料瓶）、医药瓶、和个人护理瓶。 Examples include bottles of baby bottles, beverage bottles (eg, juice bottles, water bottles, soda bottles, alcoholic beverage bottles), medicine bottles, and personal care bottles. 饮料瓶可以具有2升的容量、20盎司的容量、 16.9盎司的容量、12盎司的容量、6盎司的容量、4盎司的容量、或200至800克的填充重量。 Beverage bottle may have a capacity of 2 liters, the capacity of 20 ounces, 16.9 ounces capacity, the capacity of 12 ounces, six ounces capacity, the capacity of 4 ounces, or 200 to 800 g of fill weight. 可以通过各种过程来形成这些容器，其取决于待使用的特定材料和容器的所需性能或特性。  The containers may be formed by various processes, depending on the particular materials and containers to be used or the desired performance characteristics. 用于形成容器的过程的实例包括:热成型、共挤出、层压、和涂层过程、注射模塑、 吹塑、包覆模塑、以及包括至少一种前述项的方法;例如，共注射模塑、注射包覆模塑、注射吹塑(例如，共注射吹塑）、注射拉伸吹塑、挤出吹塑、和挤出拉伸吹塑(一个或两个步骤）。 Examples of a process for forming the container comprising: thermoforming, coextrusion, lamination, and coating processes, injection molding, blow molding, coating molding, and a method comprising at least the foregoing items; e.g., total injection molding, injection-coated molding, injection blow molding (e.g., co-injection blow molding), injection stretch blow molding, extrusion blow molding, and extrusion stretch blow molding (one or two steps). 例如，生产过程可以包括具有多层的挤出吹塑、多层的注射模塑或以两种或大于两种材料来吹制生产的预成型件。  For example, the production process may include a preform having a multilayer extrusion blow molding, multilayer injection molding or in combination of two or more than two materials blown production. 例如，挤出吹塑是借助于在机筒(cylinder)内的螺杆来融化和塑化颗粒的过程。  For example, in extrusion blow molding by means of a cylinder (Cylinder) screw to melt the particles and plasticizing process. 可以将塑化聚合物挤出为中空管，其称为型坯。 Plasticized polymer can be extruded as a hollow tube called a parison. 然后可以将型坯切割成一定长度并引入吹塑模具，然后经受空气处理。 Then the parison can be cut to length and introduced into the blow mold, and then subjected to air treatment. 然后空气可以使中空型坯压紧模具的侧面。 Air may then pressing the side surface of the hollow parison mold. 然后在短暂的冷却时间以后，可以从模具排出部件。 Then after a short cooling time, may be discharged from the mold member. 挤出机可以产生连续中空型坯，并从而允许许多模具用于所期望的生产。 A continuous extruder may produce a hollow parison, and thereby allows many mold for production of a desired. 为了生产具有多层的容器，过程可以类似于吹塑过程，不同之处在于，多层挤出头可以用来形成容器的多层。  In order to produce a container having a plurality of layers, the process may be similar to the blow molding process, except that the multilayer extrusion head may be used to form a multilayer container. 这样的模头允许材料在层中流动以致可以实现均匀厚度的型坯。 Such a die material allowed to flow in layers so that the thickness uniformity can be achieved parison. 这样的过程的优点在于，针对特殊或需要的要求，可以使用具有各种性能的不同类型的材料。 The advantage of such a process is that for the special needs or requirements, may use different types of materials having various properties. 另一种过程还可以是共注射模塑容器，其包含两种相似或不同种类的材料。  Another process is co-injection molding may also be a container, a material comprising two similar or different kinds. 具有分开进入熔体流的两种相似或不同种类的材料进入空腔，其中材料冷却下来以获得最终形状。 Two kinds separately into the melt stream having a similar or different kind of material into the cavity, wherein the material is cooled down to obtain the final shape. 共注射喷嘴或类似阀门可以用于这样的过程以实现进入空腔的均匀熔体流动。 Coinjection nozzle valve or the like may be used in such a process to achieve a uniform melt flow into the cavity. 类似的过程还可以在第一步骤中用于预制件成型，然后这些预制件可以进一步用于吹塑过程。 A similar process may also be used for forming the preform in a first step, the preform may then be further process for blow molding. 还可以用来形成本文公开的容器的另一种过程可以是注射吹塑或拉伸吹塑。 Another process  can also be used to form the container disclosed herein may be injection blow molding or stretch blow molding. 在注射吹塑工艺中，可以通过标准注射过程来首先模塑预制件，然后可以将其转移到吹塑站以及充气和冷却下来。 In the injection blow molding process, by a standard injection molding process to first preform can then be transferred to the blow station and the inflator and cools down. 注射吹塑机可以基于挤出机机筒和螺杆组件，其可以融化聚合物。 It may be based on the injection blow molding machine extruder barrel and screw assembly, which can melt the polymer. 可以将熔融聚合物送入热流道歧管，此处它可以通过喷嘴被注射进入中空加热预成型模具。 The molten polymer may be fed into the hot runner manifold, where it can be injected through the nozzle into the hollow preform is heated die. 预成型模具可以形成外部形状并且可以围绕芯模(芯棒)被夹紧，其可以形成预制件的内部形状。 Preforming tool may form the outer shape and can be clamped around a mandrel (rod), which may form the inner shape of the preform. 预制件可以包括具有厚管的附着的聚合物的完全形成的瓶/罐颈，其能够或将形成主体。 Preform may include a bottle / jar neck fully formed having a thickness of attached polymer tube, which can or will form the body. 可以打开预成型模具并可以旋转和夹紧芯棒而进入中空的冷的吹塑模具。 Preforming tool and can be opened and can be rotated into the clamping mandrel the blow mold hollow cold. 可以打开芯棒以及可以允许压缩空气进入预制件，其可以将它充气成成品形状。 It may be opened and the mandrel can allow compressed air into the preform which it can be inflated to a finished form. 在冷却期以后，可以打开吹塑模具以及可以将芯棒旋转到脱模位置。 After the cooling period, the blow mold can be opened and the mandrel can be rotated to the release position. 可以从芯棒剥去成品并在包装前进行泄漏测试。 Finished product may be stripped from the mandrel and leak tested prior to packaging. 预制件和吹塑模具可以具有许多空腔，一般三到十六个，其取决于制品尺寸和所需输出。 The preform and the blow mold may have many cavities, typically three to sixteen, depending on the product size and the desired output. 可以有三套芯棒，其允许同时预成型件注射、吹塑和脱模。 There may be three sets of mandrels, which allows simultaneous preform injection, blow molding and demolding. 在拉伸吹塑过程中，可以加热预制件高于它们的玻璃化转变温度，然后使用金属吹塑模具并利用高压空气，吹制成瓶。  In the stretch blow molding process, the preform may be heated above their glass transition temperature, and then using a metal mold using a high pressure air blow, blow-molded bottles. 可以借助于芯棒来拉伸预制件，作为过程的一部分。 The preform may be stretched, as part of the process by means of a mandrel. 在单阶段过程中，可以用同一台机器来进行预制件制造和瓶吹制。 In a single stage process, may be manufactured preforms and bottles by blowing the same machine. 一些聚合物的拉伸可以导致树脂的应变硬化，从而允许瓶具有较好的强度。 Some stretching of the polymer may cause strain hardening of the resin, allowing the bottles having good strength. 因为加热高于玻璃化转变温度可以影响透明度，所以另一种过程可以是更优选的。 Since the heating above the glass transition temperature may affect the transparency, so that other processes may be more preferable. 提供以下实施例来说明多层材料。  The following Examples illustrate the multilayer material. 实施例仅是说明性而不旨在将按照披露内容所制造的装置限制于其中阐述的材料、条件、或工艺参数。 Embodiments are illustrative only and not intended to limit the materials set forth therein, conditions, or process parameters according to the disclosure of the manufactured apparatus. 利用挤出吹塑机WMM 100/16,其具有S1/60共挤出6-7的模头和375毫升(mL)番茄酱瓶的工具，并利用LEXANtm PK2870-11204、LEXAN™ PK2870-BL8E055T、或不同的聚碳酸酯第二层，来制备单层和多层375立方厘米(cc) '番茄酱瓶'。  using an extrusion blow molding machine WMM 100/16, having a S1 / 60 6-7 coextrusion die 375 milliliters (mL) of the tool ketchup bottles, using LEXANtm PK2870-11204, LEXAN ™ PK2870 -BL8E055T, a second layer of polycarbonate or different, single and multi-prepared 375 cm3 (CC) 'ketchup bottles'. 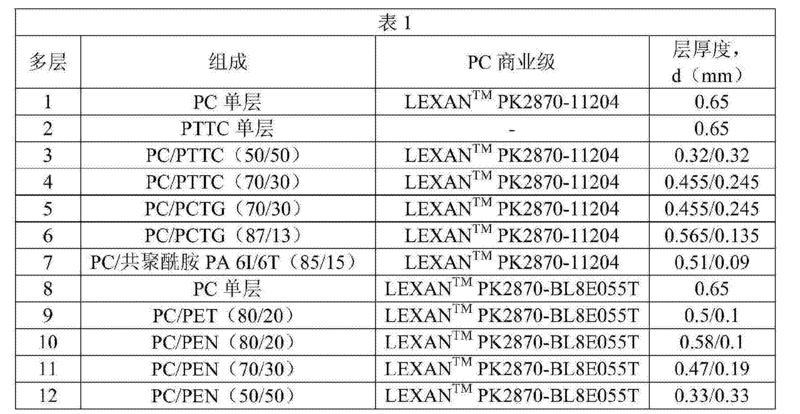 用来制造各种容器的多层的命名、细节、和组成示于表1。 Various containers for manufacturing a multilayer naming detail, and shown in Table 1. 将多层1-12分别形成为容器1-12,然后在如表2所示的特定的温度和时间下并在烘箱中干燥。  The multilayer 1-12 1-12 were formed into a container, and then dried at a specific temperature and time as shown in Table 2 in an oven. 以后，它们用于共挤出吹塑，其中使用如表2所示的处理设置(恪体压力、外层和内层树脂的熔体温度、型坯温度、循环时间、和吹塑时间）。 Later, they are used for co-extrusion blow molding, wherein the processing set (Ke pressure member, an inner layer and an outer layer melt temperature of the resin, preform temperature, cycle time, and the blow time) as shown in Table 2. 在表中，（s)是秒以及(hr)是小时。 In the table, (s) and a second (hr) is h.
 在处理以后，通过目视检查，除了容器7以外，所有的双层容器均显示出良好的粘附。  After the treatment, by visual inspection, in addition to the container 7, the double-walled container all showed good adhesion. 此外，在实施例7的聚碳酸酯和聚酰胺之间的熔体强度差异引起不一致的处理。 Further, in the embodiment of the intensity difference between the melt polycarbonates and polyamides of Example 7 causes inconsistent process. 容器3-6 和10-12显示出良好的加工性，并具有在层之间的良好的粘附。 Containers 3-6 and 10-12 show good processability, and good adhesion between layers. 值得注意的是，当相比于包含EVOH内层的多层制品时，其中上述EVOH内层包含乙烯乙烯醇共聚物(EVOH)，其更受限于其厚度范围，现在的多层制品为各个层提供更大范围的厚度。 It is noted that, when compared to the multilayer article comprising an inner layer of EVOH, the EVOH wherein the inner layer comprises ethylene vinyl alcohol copolymer (EVOH), which is more restricted range than its thickness, the multilayer article is now each layer provides a greater range of thickness. 此外，在处理中，EVOH层具有更有限的热稳定性以及高热树脂如聚碳酸酯。 Further, in the process, the EVOH layer having a more limited thermal stability and high heat resin such as polycarbonate. 使容器1-12经受高压灭菌未填充的容器的消毒过程，在Zirbus Labstar 3-4-7高压釜中张口向下：在120°C下并在1.2巴（高压釜1)下30分钟，以及在135°C下并在1.8巴（高压釜2)下45分钟。  1-12 subjecting the container during autoclaving sterilization unfilled container mouth in Zirbus Labstar 3-4-7 autoclave down: and 1.2 bar (1 autoclave) at 120 ° C for for 30 minutes and at 135 ° C and under (autoclave 2) 1.8 bar for 45 minutes. 依据按照ASTM D1003用BYK Dual Haze防护装置测得的测量结果，在消毒前后确定透射和雾度值，并且结果示于表3。 Based on the measurement result by BYK Dual Haze measured by means of protection, determined in the transmission and the haze value before and after sterilization in accordance with ASTM D1003, and the results are shown in Table 3. 在包括壁以后，借助于刀片，来确定目视剥离特性。 After comprises a wall by means of blades, peeling property was visually determined. 表3显示，包含聚对苯二甲酸乙二醇酯的容器9和包含聚萘二甲酸乙二醇酯的容器10-12具有小于85%的初始透射值和大于或等于3%的初始雾度值。  Table 3 shows that the container comprises polyethylene terephthalate container 9 comprising polyethylene naphthalate and polyethylene terephthalate having an initial 10-12% of the transmittance value of less than 85 and greater than or equal to 3% The initial haze value. 容器3-6包括大于90% 的初始透射值和小于2.5 %的初始雾度值。 3-6 container includes an initial transmission value greater than 90% and the initial haze value of less than 2.5%. 表3进一步显示，在高压釜程序1以后，容器3和4 不显示视觉雾度并且保持大于90 %的透射和小于3 %的雾度。 Table 3 further shows, after a procedure in an autoclave, the container 3 and 4 do not show the visual haze and transmittance greater than 90% retention of less than 3% and a haze. 因此，表3清楚地表明容器3和4令人惊讶地能够保持低雾度值、高透射值、并且没有剥离。 Thus, Table 3 clearly shows that the container 3 and 4 can be kept surprisingly low haze value, high transmittance value, and no peeling. 图6进一步说明表3的令人惊讶的结果。  FIG. 6 further illustrates the results in Table 3 are surprising. 图6是三个瓶2、3、和4的照片，其包含容器2、3、和4并描述于表1中的材料。 FIG 6 is a three bottles 2, 3, 4, and photographs, comprising a container 2, 3 and 4 and described in Table 1 material. 包含单层聚酯层的瓶2显示显著的雾度形成以及物理变形。 2 shows a single-layer bottle comprising a polyester layer substantially haze formation and physical deformation. 相比之下，瓶3和4不显示视觉雾度形成并且保持它们的原始形状。 In contrast, the bottle 3 and 4 do not show the visual haze formed and maintained their original shape. 其中η是层i的数目，P是给定结构的以cc.d/m2 ·天•大气压为单位的渗透率，^是i层的以微米为单位的厚度，？  where η is the number of layer i, P is in a given structure cc.d / m2 · day • atm permeability units, ^ is in micrometers of the thickness of the i layer? :是1层的以cc.mm/m2 ·天·大气压为单位的渗透系数，d是多层结构的总厚度。 : Is cc.mm/m2 · day · atm in units of permeation coefficient layer, d is the total thickness of the multilayer structure. 表3显示，容器7、11、和12的理论0^导致分别仅5.5、9.1和5.4(^/1112*天*大气压的最大改善的0TR。相比于单层聚碳酸酯容器1和8,容器3和4分别导致73.7和81.3cc/m2 · 天•大气压的降低的0TR。  Table 3 shows the theoretical container 7, 11 and 12 cause the 0 ^ (^ / 1112 * day * atm greatest improvement in 0TR only 5.5,9.1 and 5.4, respectively. Compared to a single polycarbonate container and 8, 3 and 4, respectively, resulting in container 73.7 and 81.3cc / m2 · day • atm reduced 0TR. 本申请人惊奇地发现，可以形成包含聚萘二甲酸乙二醇酯内层的多层材料，以实现大于90%的透射值和小于2.5%的低雾度值。  The present Applicant has surprisingly found, it may be formed multilayer material comprising polyethylene naphthalate, polyethylene terephthalate inner layer, to achieve a value of greater than 90% transmittance and a low haze value of less than 2.5%. 具体地，容器13-18分别形成自多层13-18， 如表4所示，以及通过薄膜共挤出过程，如表5所示。 In particular, the container is formed from a multilayer 13-18 13-18 respectively, as shown in Table, as well as co-extrusion process shown by the thin film 4, as shown in Table 5. 在表5中，（rpm)是每分钟转数。 In Table 5, (rpm) is the number of revolutions per minute. 然后测量多层13-18的光学和氧气阻隔性能并示于表6。  and then measuring the optical properties of the multilayer oxygen barrier and 13-18 shown in Table 6. 按照ISO 15105-2,附录A， 在23°C和50%相对湿度（以模拟在环境温度下液态食品的存储)下，用MOCON OTR设备，确定对于薄膜的氧气渗透率的测量结果。 According to ISO 15105-2, Annex A, at 23 ° C and 50% relative humidity (to simulate storage at ambient temperature of the liquid food product), the apparatus using MOCON OTR, for determining a measurement result of the oxygen permeability of the film. 在OTR测试以后，使多层的PEN侧暴露于氧气。 After OTR testing the multilayer PEN side is exposed to oxygen. 理论上， 可以利用单个树脂组分如PEN和聚碳酸酯的厚度和渗透率值来确定多层结构的OTR值，其中非定向PEN和聚碳酸酯的渗透率值在文献中分别书已知为1.8和I IOcc. mm/m2/大气压。 In theory, a single resin component may be utilized to determine the value of OTR multilayer structure such as thickness and permeability values ​​PEN and polycarbonate, wherein the non-directional permeability values ​​PEN and polycarbonates are known in the literature for the book 1.8 and I IOcc. mm / m2 / atm. 表6示出了通过从共挤出多层材料形成容器，可以实现大于90%的透射值和小于2.5 %的雾度值。  Table 6 shows the container formed from the multilayer material by coextrusion, can realize the transmission values ​​of greater than 90% and a haze value of less than 2.5%. 惊人地，观察到，当暴露于高压灭菌条件（在120 °C下30分钟暴露;在高于PEN的Tg的15°C下暴露)时，多层11、12、16、和17进一步显示优秀的透射性和低雾度保留，并具有分别〈1%和〈3.6%的Δ透射值和Δ雾度值。 Surprisingly, observed that, when exposed to autoclave conditions (exposure at 120 ° C 30 min; exposed above the Tg of the PEN 15 ° C), the multiple layers 11, 12, and 17 further show excellent transmittance and low haze of retention, and having respectively <and <[Delta] [Delta] haze value and the transmission value of 1% of 3.6%. 惊人地，在120°c (I.2巴）下高压灭菌30分钟和在135°C (1.8巴）下高压灭菌45分钟以后，没有观察到多层11、12、16、和17的变形。 Surprisingly, after autoclaving at 120 ° c (I.2 bar) for 30 min and 45 min at 135 ° C (1.8 bar) autoclaved not observed multilayer 11, 12, and 17 deformation. 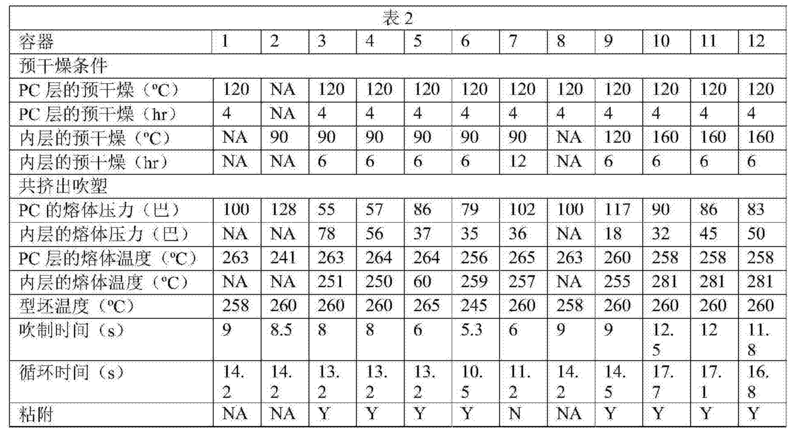 表6 示出了大于100微米的PEN层厚度导致小于10 (cc) Am2 ·天•大气压）的OTR。 Table 6 shows the PEN layer thickness of more than 100 m results in OTR of less than 10 (cc) Am2 · day • atm). 而且，多层11、 12、16、和17示出了小于6 (cc) Am2 ·大气压•天）的OTR值，其使它们特别适合于热填充的和可高压灭菌的一次性使用的包装应用，并具有优良的光学、机械、氧气阻隔、和热稳定性。 Further packaging, multilayer 11, 12, 16, and 17 illustrate less than 6 (cc) Am2 · atm • day) OTR values, which make them particularly suitable for hot-fill and autoclavable disposable application, and has excellent optical, mechanical, oxygen barrier, and thermal stability. 表6进一步显示，当相比于没有PEN的PC外层时，包含外PC层(其包含2wt%的PEN) 的多层18导致惊人的高雾度。  Table 6 further shows that, when compared to a PC without the PEN outer layers comprising an outer layer PC (containing 2wt% of the PEN) 18 results in surprisingly high haze. 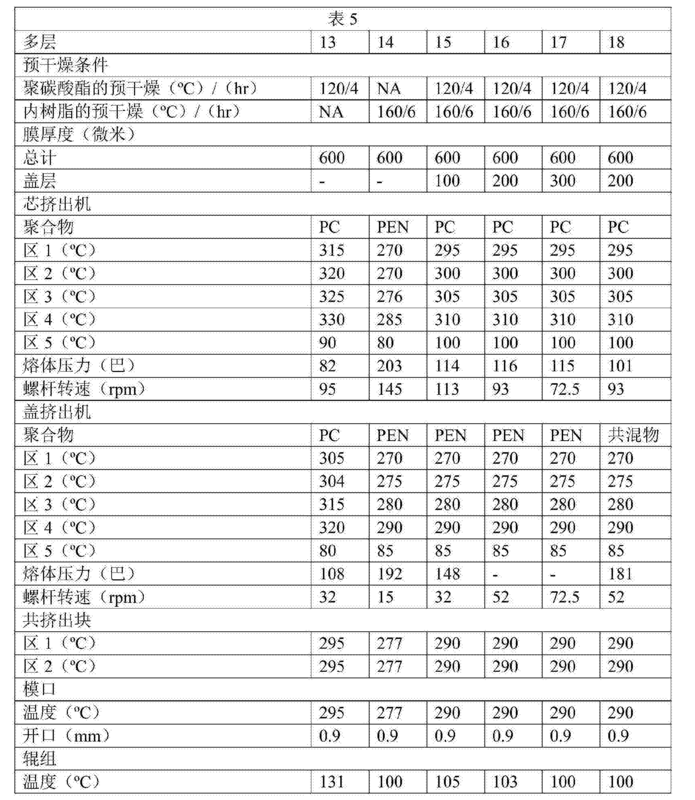 这种雾度的增加表明，PC和PEN是不可混溶的。 This increase shows that the haze, PC and PEN are immiscible. 以下阐述的是制品和其制造方法的一些实施方式。  Set forth below are some embodiments of the article and a manufacturing method thereof. 实施方式1: 一种具有内部的多层制品，上述制品包含:包含双酚A聚碳酸酯的第二层;和第一内层，其中内层形成在第二层和内部之间的阻挡层。  Embodiment 1: A multi-layer article having an interior, said article comprising: a bisphenol A polycarbonate comprising a second layer; and a first inner layer, wherein the inner layer is formed between the second layer and the inner the barrier layer. 内层包含聚酯。 An inner layer comprising polyester. 制品可以具有以下中的至少一项:在120°C下在高压釜中消毒30分钟以后小于或等于5%的透明度的降低、和在90°C下在用水热填充30分钟的50个循环以后小于或等于5%的透明度的降低。 After sterilization at 120 ° C for 30 minutes in an autoclave after less than or equal to 5% reduction of transparency, and at 90 ° C for 50 cycles of filling in hot water for 30 minutes: the article may have at least one of the following less than or equal to 5% reduction in transparency. 实施方式2:实施方式1的制品，其中聚酯包含对苯二甲酸共聚酯;聚呋喃二甲酸乙二醇酯;聚萘二甲酸乙二醇酯;或包含前述中的至少一种的组合。  Embodiment 2: Embodiment 1 of the article, wherein the polyester comprises a copolyester of terephthalic acid; polyfuran polyethylene terephthalate; polyethylene naphthalate, polyethylene terephthalate; or comprising at least one of the foregoing kinds of combinations. 实施方式3:实施方式2的制品，其中对苯二甲酸共聚酯是共聚酯，其衍生自对苯二甲酸、可选的不同于对苯二甲酸的二羧酸、和两种或更多种二醇；以及聚呋喃二甲酸乙二醇酯衍生自2,5_呋喃二羧酸；不同于2,5_呋喃二羧酸的可选的二羧酸；以及包含乙二醇的二醇组分。  Embodiment 3: The article of embodiment 2, wherein the copolyester is a copolyester of terephthalic acid copolyesters derived from terephthalic acid, optionally different from the dicarboxylic acid terephthalic acid, and two one or more diols; glycol and polyethylene furan dicarboxylate ester is derived from furandicarboxylic acid 2,5_; alternatively 2,5_ different from furan dicarboxylic acid dicarboxylic acid; and ethylene comprising alcohol glycol component. 实施方式4:实施方式3的制品，其中两种或更多种二醇包含2，2，4，4-四甲基-1，3-环丁二醇、环己烷二甲醇、乙二醇、二乙二醇、1，2_丙二醇、1，3_丙二醇、新戊二醇、1，4_丁二醇、1，5-戊二醇、1，6-己二醇、对二甲苯二醇、聚四亚甲基二醇、五螺环二醇、或2，2-二甲基-1，3-丙二醇。  Embodiment 4: The article of Embodiment 3, wherein the diol comprises two or more 2,2,4,4-tetramethyl-1,3-cyclobutanediol, cyclohexanedimethanol, ethylene glycol, diethylene glycol, propylene glycol 1,2_, 1,3_-propanediol, neopentyl glycol, 1,4_-butanediol, 1,5-pentanediol, 1,6-hexanediol, para-xylene glycol, polytetramethylene glycol, spiroglycol five, or 2,2-dimethyl-1,3-propanediol. 实施方式5:实施方式3-4中任一实施方式的制品，其中两种或更多种二醇包含80 至99111〇1%的2,2,4,4-四甲基-1，3-环丁二醇和1至2〇1]1〇1%的环己烧二甲醇、乙二醇、或包含前述中的一种或两种的组合。  Embodiment 5: The embodiment of any aspect of an embodiment 3-4 article, wherein two or more diols comprising 80% to 99111〇1 of 2,2,4,4-tetramethyl-1 , 3-cyclobutanediol and 1 to 2〇1] 1〇1% burn cyclohexyl dimethanol, ethylene glycol, or a combination comprising one or both of the foregoing. 实施方式6:实施方式3-5中任一实施方式的制品，其中不同于对苯二甲酸或2，5-呋喃二羧酸的二羧酸包含间苯二甲酸、4，4 联苯基二羧酸、萘二羧酸、反式4，4 芪二羧酸、环己烧二竣酸（cyclohexanedicarboxylic acid)、丙二竣酸(malonic dicarboxylic acid)、琥拍二竣酉爱（succinic dicarboxylic acid)、戊二竣酉爱（glutaric dicarboxylic acid)、己二竣酉爱（adipic dicarboxylic acid)、庚二竣酉爱（pimelic dicarboxylic acid)、 辛二竣酉爱（suberic dicarboxylic acid)、壬二竣酉爱（azelaic dicarboxylic acid)、十二烧二竣酸（dodecanedioic dicarboxylic acid)、讳满-I，3_二竣酸、I，2，3_三甲基-3-苯基茚满-4/，5-二羧酸、1，1，3-三甲基-5-羧基-3- (4-羧基苯基)茚满二羧酸、或包含前述中的至少一种的组合。  Embodiment 6: any of embodiments 3-5 one embodiment of the article of embodiment, wherein a dicarboxylic acid different from terephthalic acid or 2,5-furan dicarboxylic acid comprises isophthalic acid, 4,4-linked phenyl-dicarboxylic acid, naphthalene dicarboxylic acid, trans-4,4'-stilbene disulfonic acid, cyclohexyl carboxylic acids burning two (cyclohexanedicarboxylic acid), malonic carboxylic acids (malonic dicarboxylic acid), succinic Jun beat two unitary love (succinic dicarboxylic acid), glutaric Jun unitary love (glutaric dicarboxylic acid), adipic Jun unitary love (adipic dicarboxylic acid), pimelic Jun unitary love (pimelic dicarboxylic acid), Xiner Jun unitary love (suberic dicarboxylic acid), azelaic Jun unitary love (azelaic dicarboxylic acid), carboxylic acids twelve burning two (dodecanedioic dicarboxylic acid), taboo full -I, 3_ two carboxylic acids, I, 2,3_-trimethyl-3-phenyl indan -4 / 3,5-dicarboxylic acid, 1,1,3-trimethyl-5-carboxy-3- (4-carboxyphenyl) indan dicarboxylic acid, or a combination comprising at least one of the foregoing. 实施方式7:实施方式3-6中任一实施方式的制品，其中，基于在对苯二甲酸共聚酯中或在聚呋喃二甲酸乙二醇酯中的总摩尔数，对苯二甲酸或2,5_呋喃二羧酸的存在量为70 至IOOmol %以及二羧酸的存在量为0至30mol %。  Embodiment 7: The article of any of embodiments 3-6 of an embodiment in which, based on a copolyester of terephthalic acid or the total number of moles of polyethylene glycol furandicarboxylic acid ester, terephthalic 2,5_-furan dicarboxylic acid or dicarboxylic acid is present in an amount of 70 to IOOmol%, and the dicarboxylic acid is present in an amount of 0 to 30mol%. 实施方式8:实施方式2-7中任一实施方式的制品，其中聚酯具有如在25 °C下在60: 40 (wt:wt)苯酸：四氯乙烧溶液中并在0.5克/100毫升下确定的0.35至小于0.70分升/克的固有粘度。  Embodiment 8: Embodiment 2-7 article of any one of the embodiments, wherein the polyester has as at 25 ° C for 60: 40 (wt: wt) benzoic acid: tetrachloro acetate solution and burned determined 0.5 g / 100 ml to 0.35 intrinsic viscosity less than 0.70 dl / g.
 实施方式9:前述实施方式中任一项的制品，其中聚酯包含五螺环二醇共聚酯，其包含衍生自对苯二甲酸和对苯二甲酸二甲酯之一或两者的重复单元。  Embodiment 9: The article of one of the preceding embodiments, wherein the polyester comprises five spiroglycol copolyester comprising units derived from terephthalic acid and dimethyl terephthalate one or two those repeating units. 实施方式10:前述实施方式中任一项的制品，其中聚酯包含五螺环二醇共聚酯，其中五螺环二醇共聚酯包含聚(五螺环二醇对苯二甲酸酯)_共-聚(对苯二甲酸乙二醇酯）。  Embodiment 10: article of any one of the preceding embodiments, wherein the polyester comprises copolyester spiroglycol five, five spiroglycol copolyester comprises poly (five spiroglycol terephthaloyl carboxylate) _ co - poly (ethylene terephthalate). 实施方式11:任何前述实施方式的制品，其中聚酯包含重复单元，其衍生自间苯二甲酸、4,4/_联苯基二羧酸、萘二羧酸、反式4, 芪二羧酸、环己烷二羧酸、丙二羧酸、琥珀二羧酸、戊二羧酸、己二羧酸、庚二羧酸、辛二羧酸、壬二羧酸、和十二烷二羧酸、茚满-1，3-二羧酸、1，2，3-三甲基-3-苯基茚满-4'5-二羧酸、1，1，3-三甲基-5-羧基-3- (4-羧基苯基） 茚满二羧酸、或包含前述中的至少一种的组合。  Embodiment 11: The article of any preceding embodiment, wherein the polyester comprising repeating units derived from isophthalic acid, 4,4 / _ biphenyl dicarboxylic acid, naphthalenedicarboxylic acid, trans-4, stilbene dicarboxylic acid, cyclohexane dicarboxylic acid, malonic acid, succinic acid, glutaric acid, adipic acid, pimelic acid, suberic acid, azelaic acid, and dodecane alkyl dicarboxylic acid, indan-1,3-dicarboxylic acid, 1,2,3-trimethyl-3-phenyl indan -4'5- dicarboxylic acid, 1,1,3-trimethyl 5-carboxy-3- (4-carboxyphenyl) indan dicarboxylic acid, or a combination comprising at least one of the foregoing. 实施方式12:前述实施方式中任一项所述的制品，其中聚酯包含对苯二甲酸共聚酯，其包含对苯二甲酸二甲酯、1，4_环己烷二甲醇、和2,2,4,4_四甲基-1，3-环丁二醇。  Embodiment 12: The article of any of the preceding embodiments preceding claim, wherein the polyester comprises a copolyester of terephthalic acid, dimethyl terephthalate comprising, cyclohexane dimethanol 1,4_ and 2,2,4,4_ tetramethyl-1,3-cyclobutanediol. 实施方式13:前述实施方式中任一项所述的制品，其中聚酯包含聚(2,2,4,4_四甲基-1，3-环亚丁基对苯二甲酸酯)-共-聚(环己烷二亚甲基对苯二甲酸酯）。  Embodiment 13: The article of any one of the preceding embodiments, wherein the polyester comprises poly (1,3-butylene 2,2,4,4_ tetramethyl terephthalate ) - co - poly (cyclohexane dimethylene terephthalate). 实施方式14:前述实施方式中任一项所述的制品，其中聚酯包含聚(环己烷二亚甲基对苯二甲酸酯)-共-聚(对苯二甲酸乙二醇酯），其包含大于50至99.9mol %的聚（1，4-环己烷二亚甲基对苯二甲酸酯）。  Embodiment 14: The article of any of the preceding embodiments preceding claim, wherein the polyester comprises a poly (cyclohexane-dimethylene terephthalate) - co - poly (ethylene terephthalate alcohol esters) containing greater than 50 to 99.9 mol% of poly (1,4-cyclohexane dimethylene terephthalate). 实施方式15:前述实施方式中任一项所述的制品，其中聚酯包含聚(环己烷二亚甲基对苯二甲酸酯)-共-聚（对苯二甲酸乙二醇酯），其包含大于50至99.9mol%的聚(对苯二甲酸乙二醇酯）。  Embodiment 15: The article of any preceding embodiment, one of, wherein the polyester comprises a poly (cyclohexane-dimethylene terephthalate) - co - poly (ethylene terephthalate alcohol esters), poly comprising greater than 50 to 99.9 mol% of (ethylene terephthalate). 实施方式16:前述实施方式中任一项所述的制品，其中聚酯衍生自对苯二甲酸和二羧酸，以及其中，基于在聚酯中的总摩尔数，对苯二甲酸的存在量为70至lOOmol%和二羧酸的存在量为〇至30mol%，具体地，大于0至30至30mol%。  Embodiment 16: The article of any preceding embodiment, one of, wherein the polyester is derived from a pair, and wherein, in the polyester based on the total moles of terephthalic acid and dicarboxylic acid, terephthalic acid is present in an amount of 70 to lOOmol% and dicarboxylic acid is present in an amount of square to 30mol%, specifically, greater than 0 to 30 to 30mol%. 实施方式17:前述实施方式中任一项所述的制品，其中制品具有以下中的至少一项:在120°C下在高压釜中消毒30分钟以后小于或等于5%的透明度的降低，以及在90°C下用水热填充30分钟的50个循环以后小于或等于5%的透明度的降低。  Embodiment 17: The article of any preceding embodiment, one of, wherein the article has at least one of the following: sterilization transparency equal to 5% or less than 30 minutes in an autoclave to 120 ° C decreases, and heat at 90 ° C for 50 cycles filled with water after 30 minutes is less than or equal to 5% reduction in transparency. 实施方式18:前述实施方式中任一项所述的制品，其中双酸A聚碳酸酯包含均聚碳酉支醋。  Embodiment 18: article of any one of the preceding embodiments, wherein the diacid A polycarbonate comprises polycarbonate are branched unitary vinegar. 实施方式19:前述实施方式中任一项所述的制品，其中第二层包含回收聚碳酸酯、 回收聚酯、或包含前述中的一种或两种的组合。  Embodiment 19: The article of any preceding embodiment, one of, wherein the second layer comprises a polycarbonate recovery, recycled polyester, or a combination of the foregoing containing one or two. 实施方式20:前述实施方式中任一项所述的制品，进一步包含粘附层和第三聚酯层的一种或两种。  Embodiment 20: The article of one embodiment of any of the preceding embodiments, further comprising one or both of the third adhesive layer and the polyester layer. 实施方式21:前述实施方式中任一项所述的制品，其中制品具有如按照ASTM D-1003-00程序A使用2.5毫米(mm)试验样板、分光光度计，并利用具有漫射照明的施照体C，在单向观察的情况下，所测得的大于或等于90 %的透明度。  Embodiment 21: The article of any preceding embodiment, one of, wherein the article has a (mm) as a test plate using 2.5 mm according to ASTM D-1003-00 procedure A, a spectrophotometer, and using a diffusion having lighting illuminant C, as seen in the case of one-way, the measured greater than or equal to 90% transparency. 实施方式2 2 :前述实施方式中任一项所述的制品，其中制品具有如按照ASTM D1003用BYK Dual Haze防护装置测得的小于或等于2.5%的雾度。  Embodiment 22: The article of any preceding embodiment, one of, wherein the article has a 2.5% or less as a haze according to ASTM D1003 BYK Dual Haze measured by the guard. 实施方式23:前述实施方式中任一项所述的制品，其中制品的总厚度是0.4至4mm。  Embodiment 23: article of any one of the preceding embodiments according to the total thickness of the article is 0.4 to 4mm. 实施方式24:前述实施方式中任一项所述的制品，其中内层的厚度是0.1至1_。  Embodiment 24: product according to any one of the embodiments, the thickness of the inner layer is 0.1 to 1_. 实施方式25:前述实施方式中任一项所述的制品，其中制品是容器，以及，在使用期间，第二层没有接触在容器内的内含物。  Embodiment 25: article of any one of the preceding embodiments, wherein the article is a container, and, during use, the second layer not in contact with the contents within the container. 实施方式26:前述实施方式中任一项所述的制品，其中制品具有厚度以及其中第二层形成大于或等于50%的制品厚度和内层形成小于或等于50%的制品厚度。  Embodiment 26: article of any one of the preceding embodiments, wherein the article has a thickness and wherein the second layer is greater than or equal to 50% of the thickness of the article and the inner layer is less than or equal to 50% of the thickness of the article. 实施方式27:前述实施方式中任一项所述的制品，其中制品是具有高达37.8升的容量的瓶。  Embodiment 27: The article of any preceding embodiment, one of, wherein the article is a bottle having a capacity of 37.8 liters. 实施方式28:前述实施方式中任一项所述的制品，其中制品是婴儿奶瓶、水瓶、果酱罐、或番茄酱罐。  Embodiment 28: The article of any preceding embodiment, wherein the article is a baby bottles, water bottles, jam jars, cans or ketchup. 实施方式29:用于制造根据前述权利要求中任一项所述的制品的方法，包括利用以下一种或多种:热成型。  Embodiment 29: The method for producing an article according to any, including the use of one or more of the preceding claims: thermoforming. 吹塑、挤出吹塑、挤出拉伸模塑、注射模塑、注射吹塑、注射拉伸吹塑、包覆模塑、或注射包覆模塑，来形成具有第二层和内层的制品。 Blow molding, extrusion blow molding, extrusion stretch molding, injection molding, injection blow molding, injection stretch blow molding, coating molding, or injection molding the coating to form a second layer and an inner layer products. 通常，本发明可以可替换地包含本文所公开的任何适当的组分，由本文所公开的任何适当的组分组成，或基本上由本文所公开的任何适当的组分组成。  Generally, the present invention may alternatively comprise any suitable components disclosed herein, any suitable component of the compositions disclosed herein, or substantially any suitable components disclosed herein by the composition. 可以另外地或可替换地来配制本发明，以没有或基本上不含在现有技术的组合物中使用的任何组分、材料、成分、佐剂或物质或其否则不是实现本发明的功能和/或目标所必需的。 Any component may additionally or alternatively be formulated according to the present invention, to use no or substantially free of prior art compositions, materials, ingredients, adjuvants or species, or otherwise not achieve the functions of the present invention and / or target necessary. 所有引用的专利、专利申请、和其它参考文献通过引用整体并入本文。 All cited patents, patent applications, and other references are incorporated herein by reference in their entirety. 然而，如果本申请中的术语与引用参考文献中的术语相矛盾或冲突，则来自本申请的术语优先于引用参考文献中的冲突术语。 However, if the term of reference in the present application the term & contradicts or conflicts with a reference, the term from the present application takes precedence over the conflicting term cited references therein. 除非另有说明，这里提及的测试标准是在提交优先申请的日期时的用于测量方法的最近的标准。 Recent standard method for measuring the time of the  Unless otherwise specified, the standard test mentioned here is the priority filing date of the application. 在此公开的所有范围均含端点，以及端点是可以彼此独立地组合的（例如，“高达25wt%，或更具体，5wt%至20wt%”的范围包含5wt%至25wt%”等的范围的端点和所有中间值）。“组合”包含共混物、混合物、合金、共聚物、反应产物等。此外，术语“第一”、“第二” 等，这里不表示任何顺序、数量、或重要性，而是用来表示不同于另一要素的一个要素。除非本文另有说明或与上下文明显矛盾，术语“一”和“一种”以及“该”这里不表示数量的限制， 并且应当被解释为涵盖单数和复数。如在本文中所使用的，后缀“(s)”旨在包括它所修饰的术语的单数和复数，从而包括上述术语的一个或多个(例如，薄膜包括一个或多个薄膜）。在整个说明书中参考“一种实施方式”、“另一种实施方式”、“一种实施方式”等等意味着连同实施方式一起描述的特  All ranges disclosed herein are inclusive of the endpoints, and the endpoints are independently of each other may be combined (e.g., "up to 25wt%, or, more specifically, 5wt% to 20wt%" comprising a range of 5wt% to 25wt% ", etc. the endpoints of the ranges and all intermediate values). "combination" is inclusive of blends, mixtures, alloys, copolymers, reaction products, etc. Furthermore, the terms "first," "second," and the like, herein do not denote any order, quantity , or importance, but rather are used indicates different from one element to another element, unless otherwise indicated herein or clearly contradicted by context, the terms "a" and "an" and "the" herein do not denote a limitation of quantity, and should be construed to cover both the singular and the plural. as used herein, the suffix "(s)" is intended to include modifications of its singular and the plural of the term, thereby including one or more (e.g., a thin film of the above terms comprises one or more films). Patent reference throughout the specification to "one embodiment", "another embodiment", "one embodiment," etc. means that a described embodiment with 要素(例如，特点、结构、和/或特性)包括在本文中所描述的至少一种实施方式中，并且可以或可以不存在于其它实施方式中。此外，要理解的是，在各种实施方式中，所述要素可以以任何合适的方式加以组合。除非上下文另有规定，“或”是指“和/ 或”。 Element (e.g., feature, structure, and / or characteristic) comprises at least one embodiment described herein, and may or may not be present in other embodiments. Further, it is understood that, in various embodiments embodiment, the elements may be combined in any suitable manner, unless the context requires otherwise, "or" means "and / or". 虽然已描述了特定实施方式，但是是或可能是目前无法预见的替代、修改、变化、 改进和实质等同物可能会出现于申请人或本领域技术人员。  Although particular embodiments have been described, it is or may be presently unforeseen alternatives, modifications, variations, improvements, and substantial equivalents may occur to those skilled in the art or applicant. 因此，提交的和可能被修改的所附权利要求旨在涵盖所有这样的替代、修改、变化、改进、和实质等同物。 Thus, the author can be modified and the appended claims are intended to cover all such alternatives, modifications, variations, improvements, and substantial equivalents. I · 一种具有内部的多层制品，所述制品包括： 第二层，包含双酸A聚碳酸酯；以及内层，包含对苯二甲酸共聚酯；聚呋喃二甲酸乙二醇酯;或包含前述中的至少一种的组合； 其中所述内层形成在所述第二层和所述内部之间的阻挡层;其中所述制品具有以下中的至少一项:在120°C下在高压釜中消毒30分钟以后的小于或等于5%的透明度的降低，以及在90 °C下在用水热填充30分钟的50个循环以后的小于或等于5 %的透明度的降低。 I · having an inner multilayer article of manufacture comprising: a second layer, comprises an acid bis A polycarbonate; and an inner layer comprising a copolyester of terephthalic acid; polyfuran polyethylene terephthalate; or combinations comprising at least one of the foregoing; wherein the inner barrier layer is formed between said inner and said second layer; wherein said article has at least one of the following: at 120 ° C for sterilized after 30 minutes less than or equal to 5% reduction in the transparency of the autoclave, and at 90 ° C for 50 cycles of filling in hot water for 30 minutes or less after 5% reduction in transparency. 2. 根据权利要求1所述的制品，其中所述对苯二甲酸共聚酯是衍生自对苯二甲酸、可选的不同于所述对苯二甲酸的二羧酸，与两种或更多种二醇的共聚酯;并且所述聚呋喃二甲酸乙二醇酯是衍生自2,5_呋喃二羧酸;可选的不同于所述2,5_呋喃二羧酸的二羧酸；与包含乙二醇的二醇组分的聚酯。 2. The article according to claim 1, wherein said derived from terephthalic acid, optionally a dicarboxylic acid different from terephthalic acid, terephthalic acid and two or more copolyester copolyesters more diols; and the poly furan polyethylene terephthalate derived from a dicarboxylic acid 2,5_ furan; alternatively different from the 2,5_ furan dicarboxylic acid acid; polyester with a diol component comprising ethylene glycol in. 3. 根据权利要求2所述的制品，其中所述不同于所述对苯二甲酸或2,5_呋喃二羧酸的二羧酸包括间苯二甲酸、4，4 联苯基二羧酸、萘二羧酸、反式-4，V -芪二羧酸、环己烷二羧酸、丙二羧酸、琥珀二羧酸、戊二羧酸、己二羧酸、庚二羧酸、辛二羧酸、壬二羧酸、十二烷二羧酸、茚满-1，3-二羧酸、1，2，3-三甲基-3-苯基茚满-4'5-二羧酸、1，1，3-三甲基-5-羧基-3-(4-羧基苯基)茚满二羧酸、或包含前述中的至少一种的组合。 3. The article of claim 2, wherein said dicarboxylic acid different from terephthalic acid or the 2,5_ furan dicarboxylic acids include isophthalic acid, 4,4'-biphenyl dicarboxylic acid , naphthalenedicarboxylic acid, trans -4, V - stilbene dicarboxylic acid, cyclohexane dicarboxylic acid, malonic acid, succinic acid, glutaric acid, adipic acid, pimelic acid, suberic acid, azelaic acid, dodecanedioic acid, indan-1,3-dicarboxylic acid, 1,2,3-trimethyl-3-phenyl indan two -4'5- carboxylic acid, 1,1,3-trimethyl-5-carboxy-3- (4-carboxyphenyl) indan dicarboxylic acid, or a combination comprising at least one of the foregoing. 4. 根据权利要求2或权利要求3所述的制品，其中基于在所述对苯二甲酸共聚酯中或在所述聚呋喃二甲酸乙二醇酯中的总摩尔数，所述对苯二甲酸或2,5-呋喃二羧酸以70至IOOmol %的量存在，并且所述可选的二羧酸以大于0至30mol %的量存在。 4. The article of claim 3 according to claim 2 or claim 3, wherein based on said copolyester of terephthalic acid, or the total moles of polyethylene glycol furan dicarboxylate ester, the p 2,5-furan dicarboxylic acid or dicarboxylic acid in an amount of 70 to IOOmol% is present, and said optional dicarboxylic acid in an amount greater than 0 to 30mol% is present. 5. 根据权利要求2-4中任一项所述的制品，其中所述两种或更多种二醇包括2,2,4,4-四甲基-1，3-环丁二醇、环己烷二甲醇、乙二醇、二乙二醇、1，2_丙二醇、1，3_丙二醇、新戊二醇、1，4-丁二醇、1，5-戊二醇、1，6-己二醇、对二甲苯二醇、聚四亚甲基二醇、五螺环二醇、或2，2_二甲基-1，3_丙二醇。 5. The article of any one of claims 2-4 claims, wherein said two or more diols include 2,2,4,4-tetramethyl-1,3-cyclobutanediol, cyclohexanedimethanol, ethylene glycol, diethylene glycol, propylene glycol 1,2_, 1,3_-propanediol, neopentyl glycol, 1,4-butanediol, 1,5-pentanediol, 1, 1,6-hexanediol, p-xylene glycol, polytetramethylene glycol, spiroglycol five or 2,2_ glycol dimethyl -1,3_. 6. 根据前述权利要求中任一项所述的制品，其中所述内层含有包含聚（对苯二甲酸2， 2，4,4_四甲基-1，3-环亚丁基酯)-共-聚(对苯二甲酸环己烷二亚甲基酯）的对苯二甲酸共聚醋。 6. The article as claimed in any one of the preceding claims, wherein said inner layer comprises comprises poly (2, four 2,4,4_ acid methyl ester 1,3-butylene) - copoly (cyclohexane dimethylene terephthalate ester) terephthalate copolymerized vinegar. 7. 根据前述权利要求中任一项所述的制品，其中所述内层含有包含聚（对苯二甲酸环己烷二亚甲基酯)-共-聚(对苯二甲酸乙二醇酯）的对苯二甲酸共聚酯，所述聚(对苯二甲酸环己烷二亚甲基酯）-共-聚（对苯二甲酸乙二醇酯）包含大于50mol %至99 · 9mol %的聚（对苯二甲酸1，4_环己烷二亚甲基酯）。 7. The article as claimed in any one of the preceding claims, wherein said inner layer comprises comprises poly (cyclohexane-dimethylene terephthalate terephthalate) - co - poly (ethylene terephthalate ) terephthalate copolyester, the poly (cyclohexane-dimethylene terephthalate terephthalate) - co - poly (ethylene terephthalate) comprises greater than 50mol% to 99 · 9mol% poly (cyclohexane-dimethylene terephthalate 1,4_ methyl ester). 8. 根据前述权利要求中任一项所述的制品，其中所述内层含有包含聚（对苯二甲酸环己烷二亚甲基酯)-共-聚(对苯二甲酸乙二醇酯）的对苯二甲酸共聚酯，所述聚(对苯二甲酸环己烷二亚甲基酯）-共-聚（对苯二甲酸乙二醇酯）包含大于50mol %至99 · 9mol %的聚（对苯二甲酸乙二醇酯）。 8. The article as claimed in any one of the preceding claims, wherein said inner layer comprises comprises poly (cyclohexane-dimethylene terephthalate terephthalate) - co - poly (ethylene terephthalate ) terephthalate copolyester, the poly (cyclohexane-dimethylene terephthalate terephthalate) - co - poly (ethylene terephthalate) comprises greater than 50mol% to 99 · 9mol% poly (ethylene terephthalate). 9. 根据前述权利要求中任一项所述的制品，其中所述内层含有包含聚（对苯二甲酸五螺环二醇酯)_共-聚(对苯二甲酸乙二醇酯）的对苯二甲酸共聚酯。 (Ethylene terephthalate) is poly - 9. The article of any one preceding claim in claim 1, wherein said inner layer comprises comprising poly (five spiro glycol terephthalate) _ co terephthalic copolyester. 10. 根据前述权利要求中任一项所述的制品，其中所述对苯二甲酸共聚酯或所述聚呋喃二甲酸乙二醇酯具有在25°C下在60:40 (wt:wt)的苯酸：四氯乙烷溶液中在0.5克/100毫升的浓度下确定的〇. 35至小于0.70分升/克的固有粘度。 10. The article as claimed in any one of the preceding claims, wherein the having at 25 ° C for the 60:40 (wt terephthalate copolyester or polyethylene glycol furan dicarboxylate: wt ) in benzene acid: tetrachloroethane was determined at a concentration of 0.5 g / 100 ml and less than 35 square intrinsic viscosity of 0.70 dl / g.
12. 根据前述权利要求中任一项所述的制品，其中所述制品是容器，并且在使用期间， 所述第二层不与所述容器内的内含物接触。 12. The article as claimed in any one of the preceding claims, wherein said article is a container and, during use, the second layer not in contact with the contents within the container. 13. 根据前述权利要求中任一项所述的制品，其中所述制品具有厚度，并且其中所述第二层形成所述制品的厚度的大于或等于50%，并且所述内层形成所述制品的厚度的小于或等于50%。 13. The article as claimed in any one of the preceding claims, wherein said article has a thickness, and wherein the second layer is greater than or equal to 50% of the thickness of the article is formed, and wherein said inner layer the thickness of the article is less than or equal to 50%. 14. 根据前述权利要求中任一项所述的制品，其中所述制品是具有高达37.8升的容量的瓶，其中所述制品是奶瓶、果酱罐、番茄酱罐、或水瓶。 14. The article as claimed in any one of the preceding claims, wherein said article is a bottle having a capacity of 37.8 liters, wherein said article is a bottle, jam jars, ketchup jar or bottle. 15. —种制造前述权利要求中任一项所述的制品的方法，包括： 使用热成型、吹塑、挤出吹塑、挤出拉伸模塑、注射模塑、注射吹塑、注射拉伸吹塑、包覆模塑、注射包覆模塑、或包含前述中的至少一种的组合来形成具有所述第二层和所述内层的所述制品。 15. - Method article according to any one of the preceding claims for producing species, comprising: using a thermoforming, blow molding, extrusion blow molding, extrusion stretch molding, injection molding, injection blow molding, injection stretch stretch blow molding, coating molding, injection molding covering, comprising at least one or a combination of the foregoing to form the article having the second layer and the inner layer. ES2208520T3 (en) 2004-06-16 Pressurized container with ribbed appearance with improved durability.